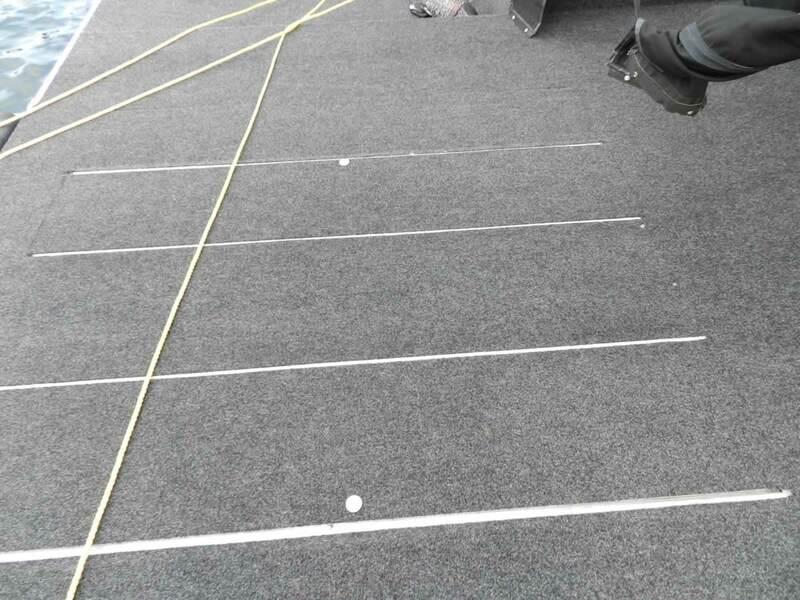 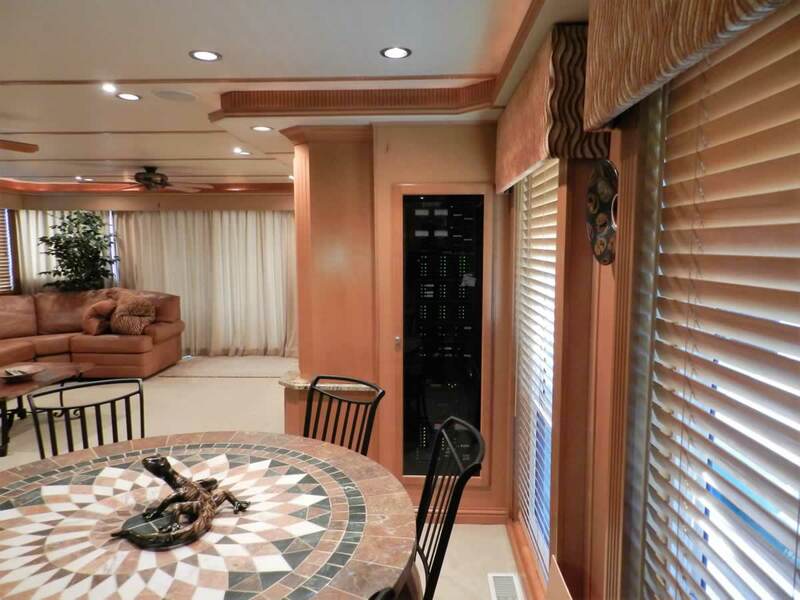 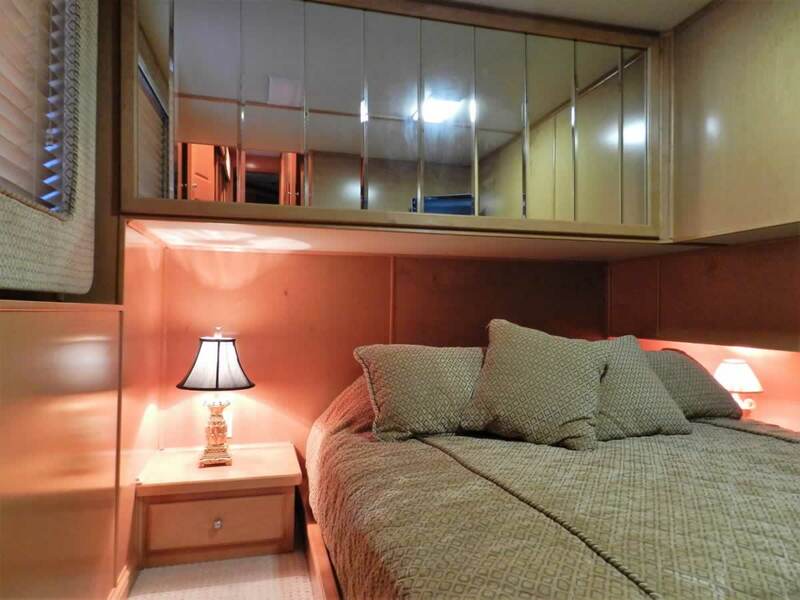 Get ready to have your houseboat fantasy come true. 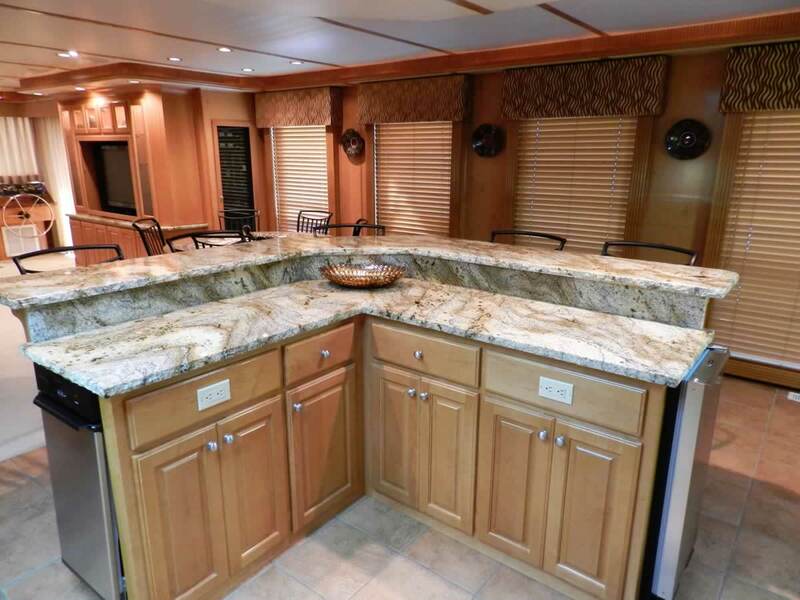 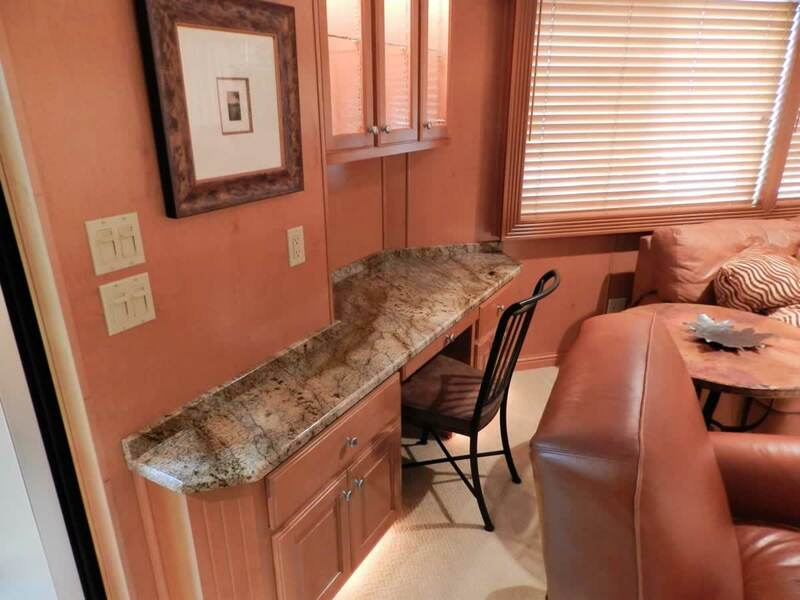 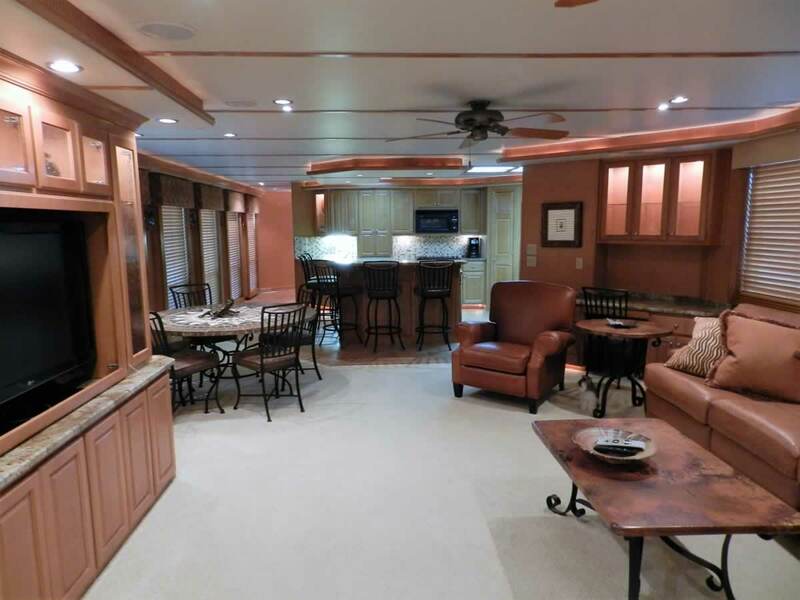 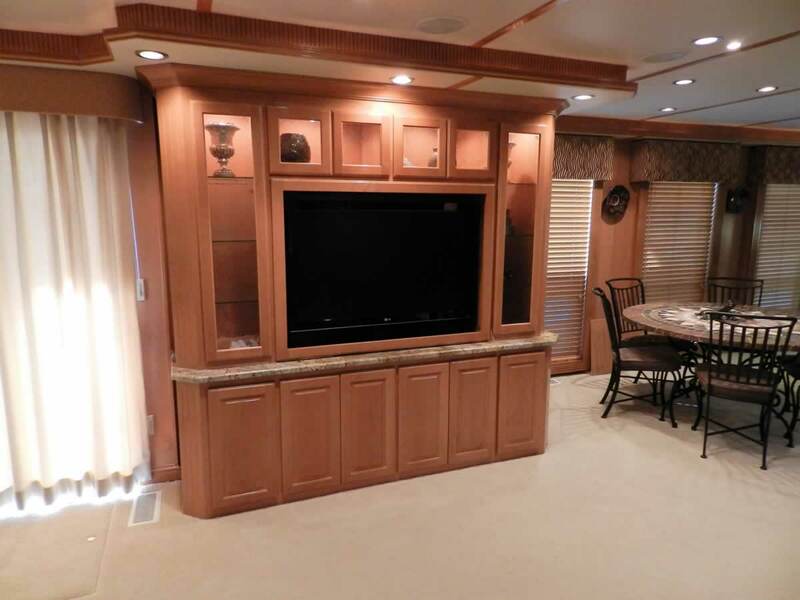 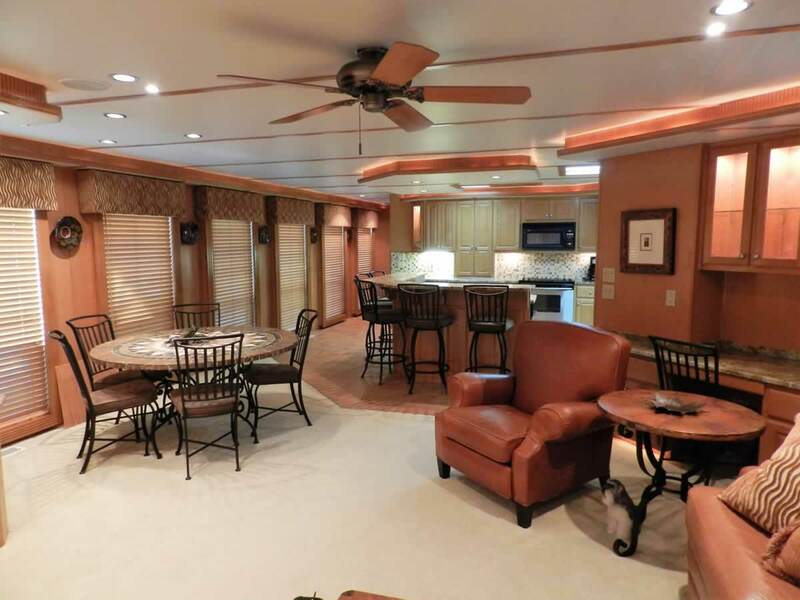 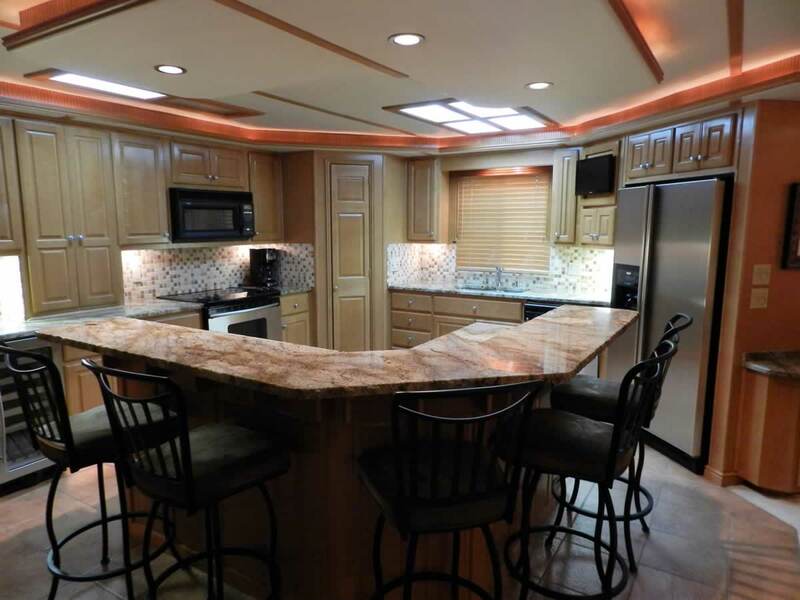 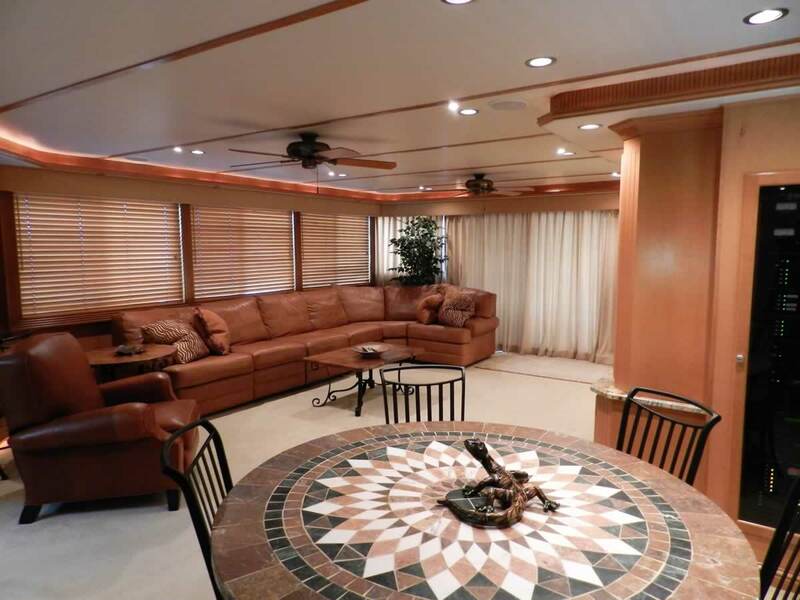 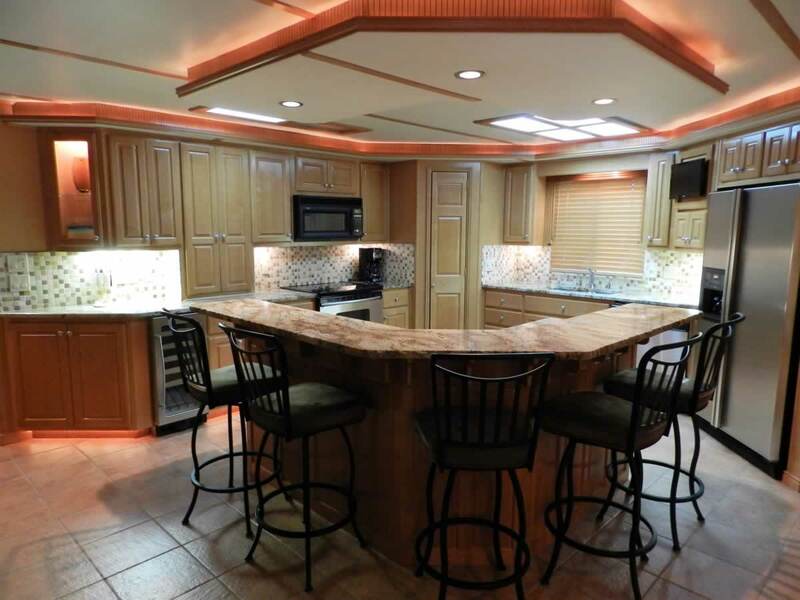 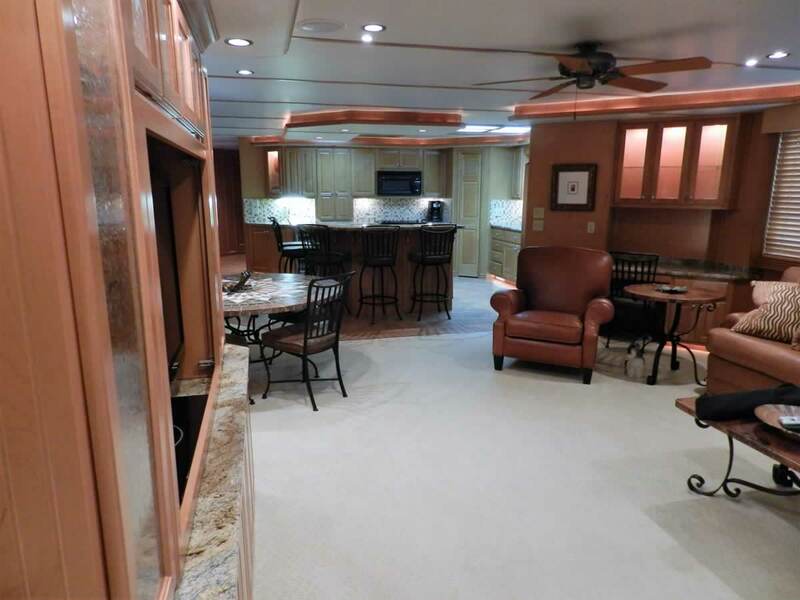 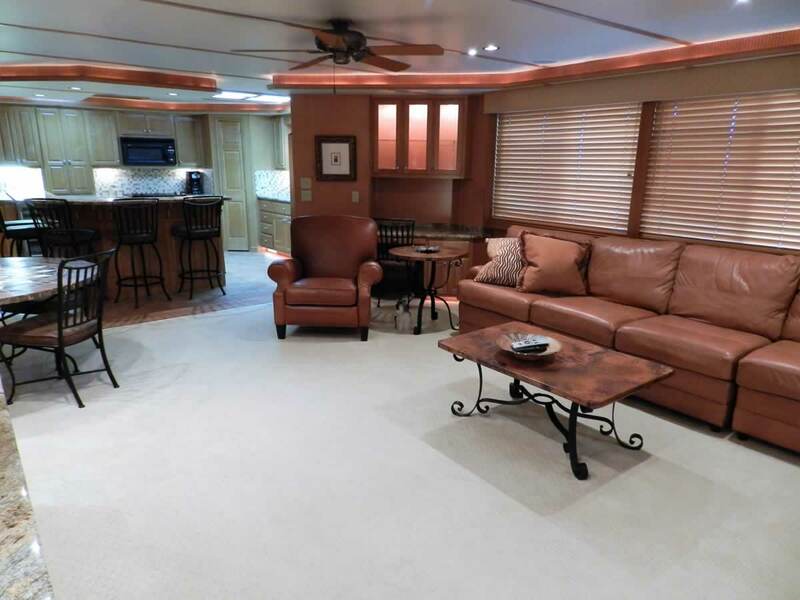 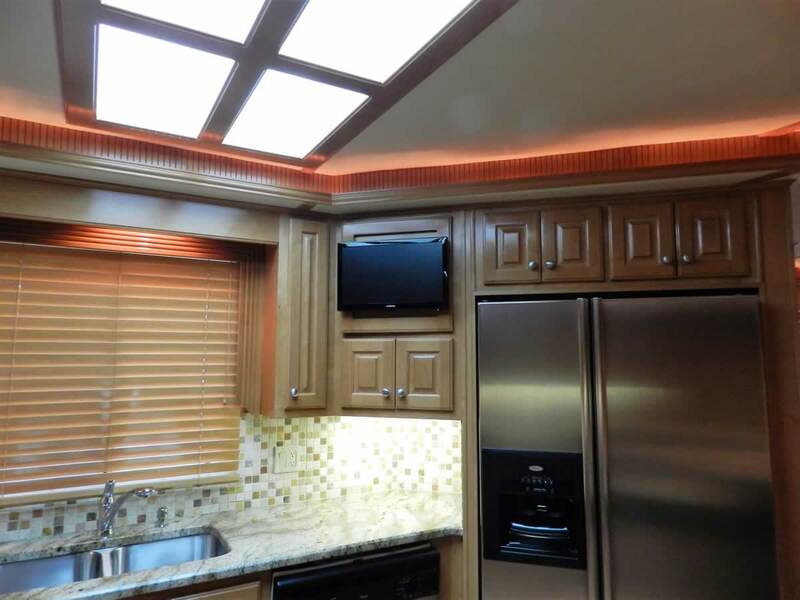 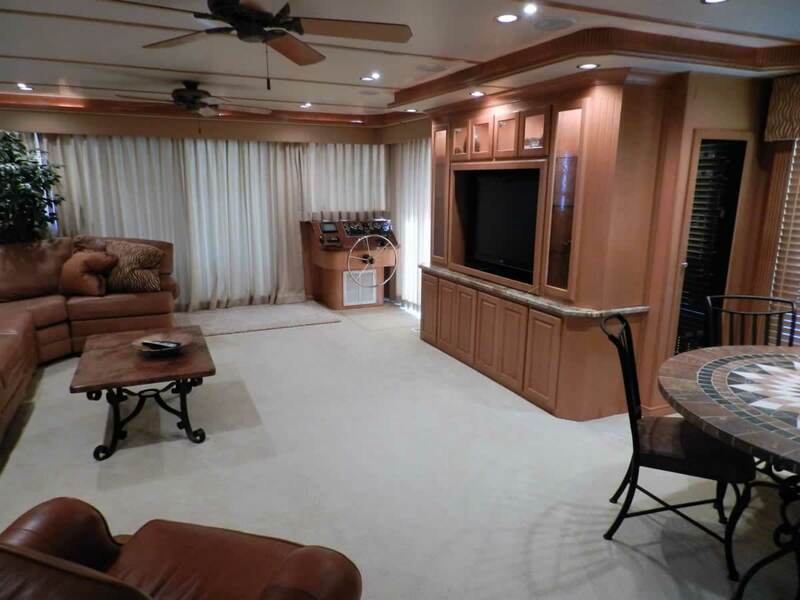 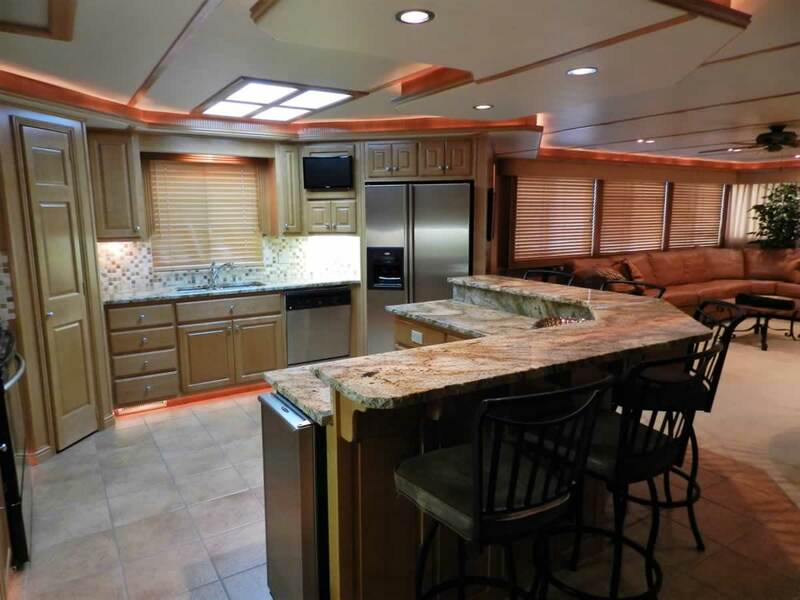 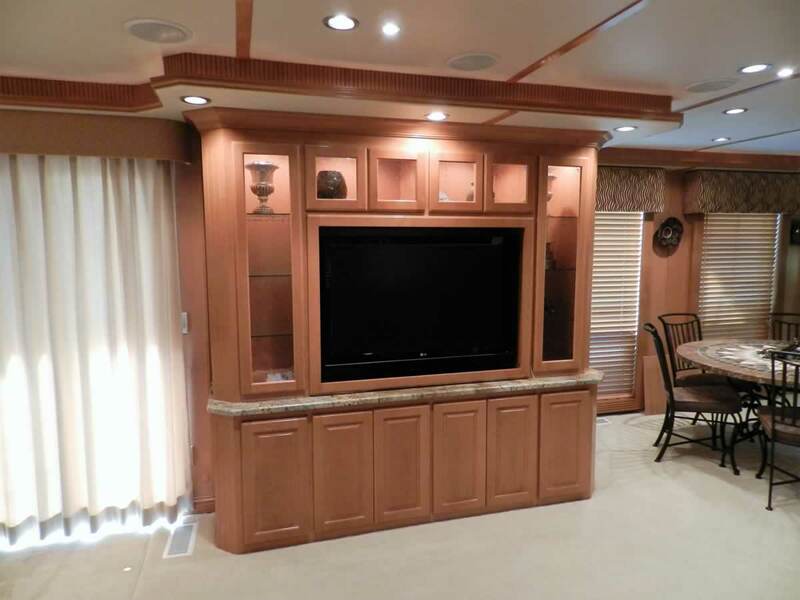 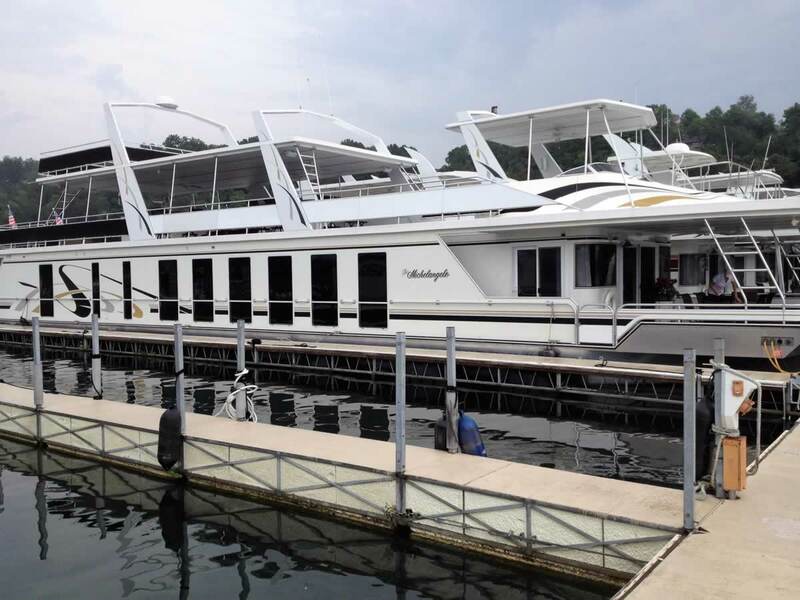 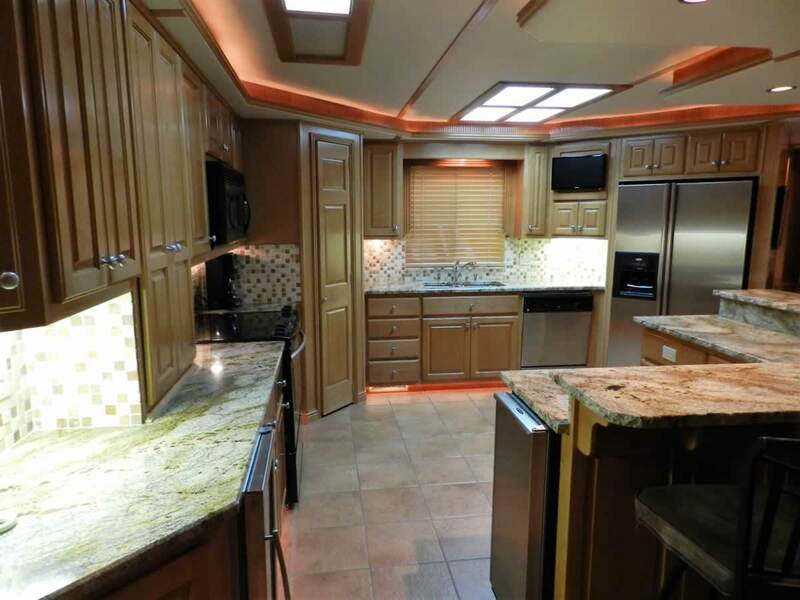 The Michelangelo is a top notch boat that is ready for boating adventures. 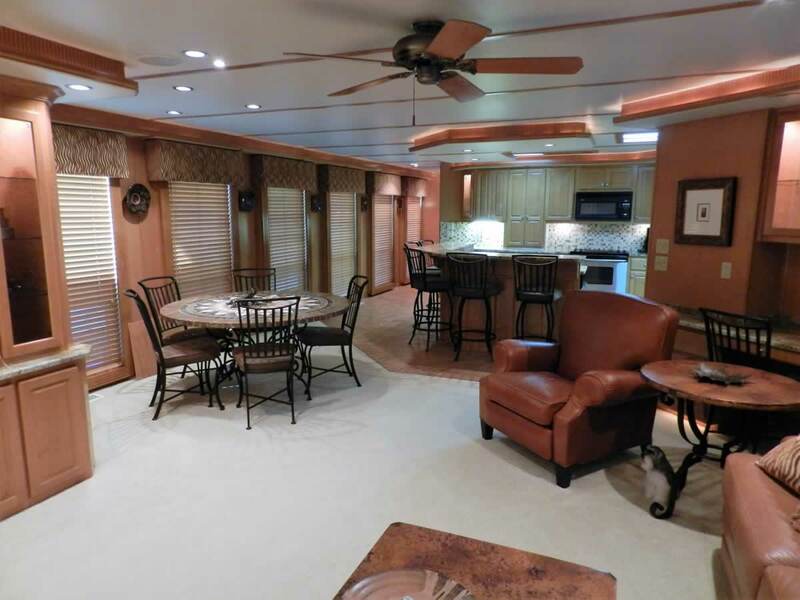 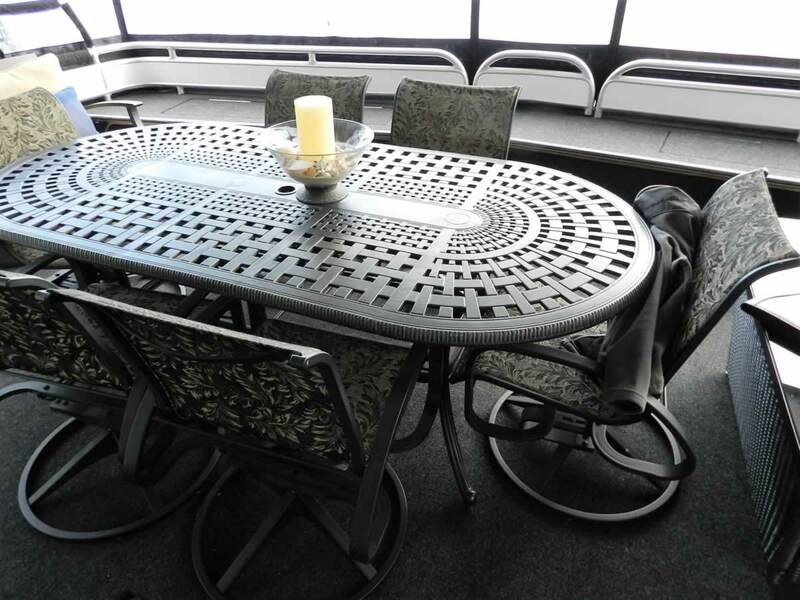 Step onto the spacious front deck with plenty of room to entertain with a table with seating for 6. 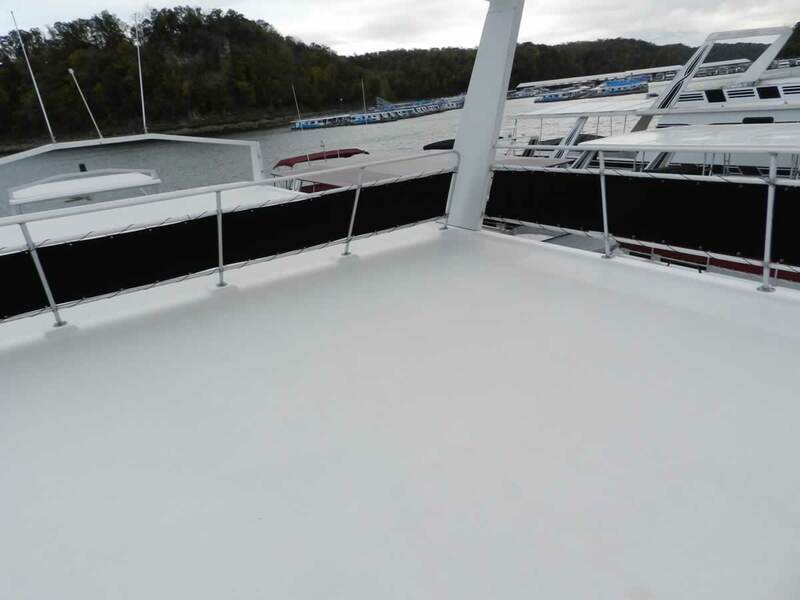 Front deck also includes a wand style shower and hook up for the built in pressure washer system which makes clean-up easy. 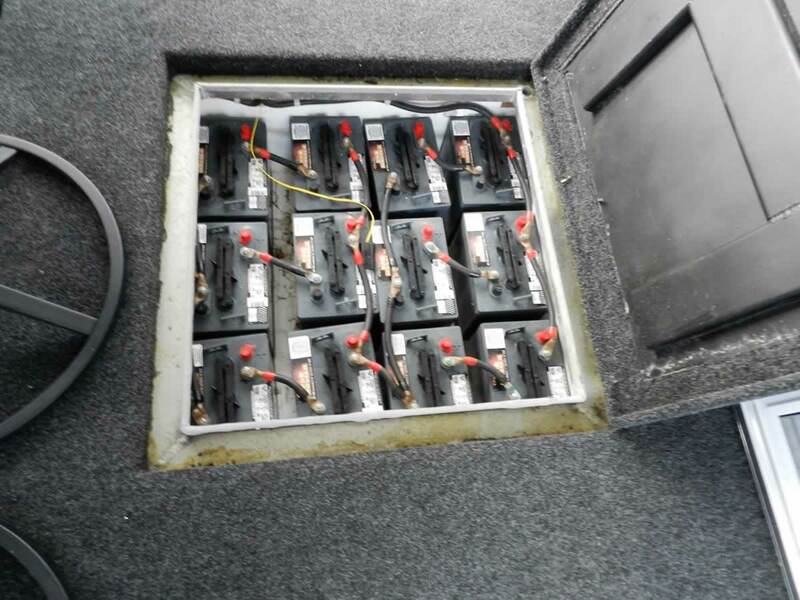 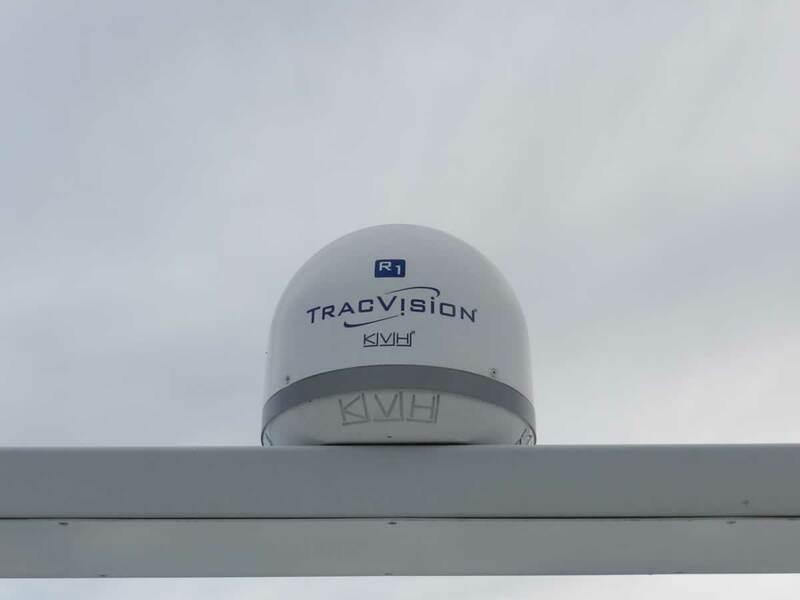 Three large hatches provide storage and easy battery access. 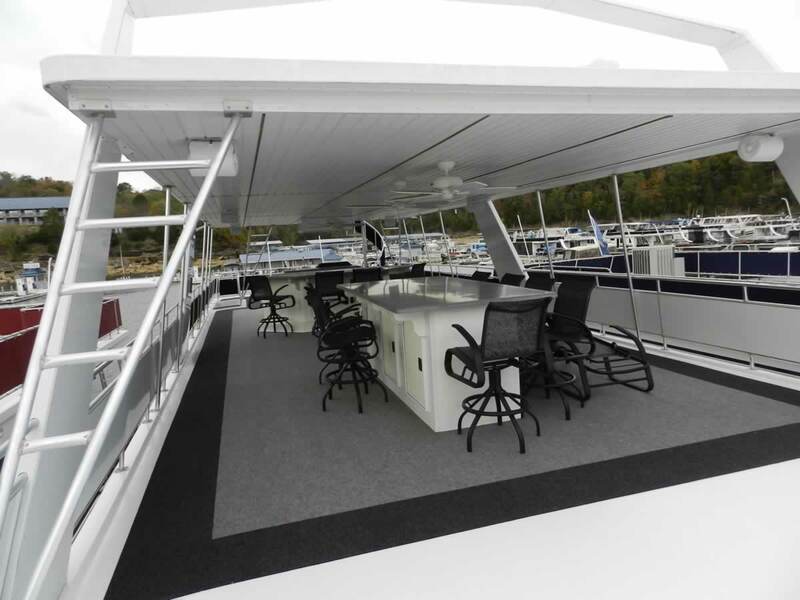 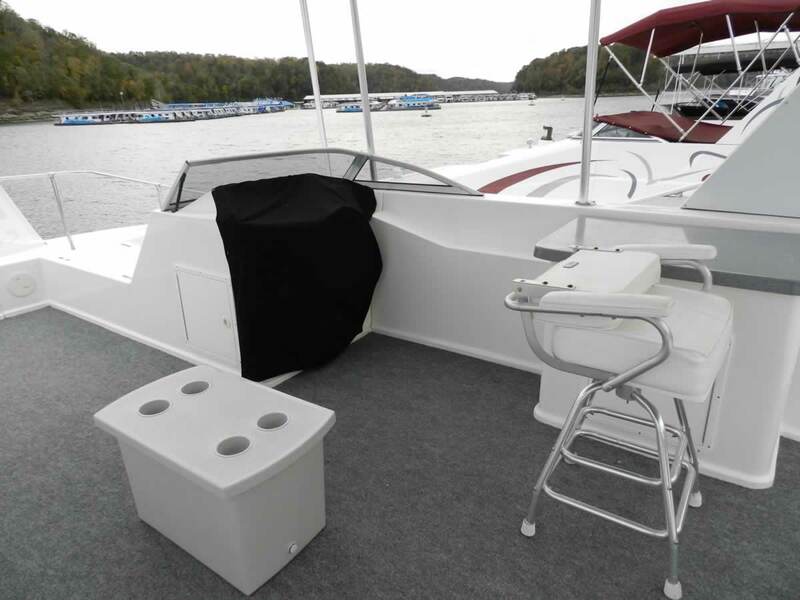 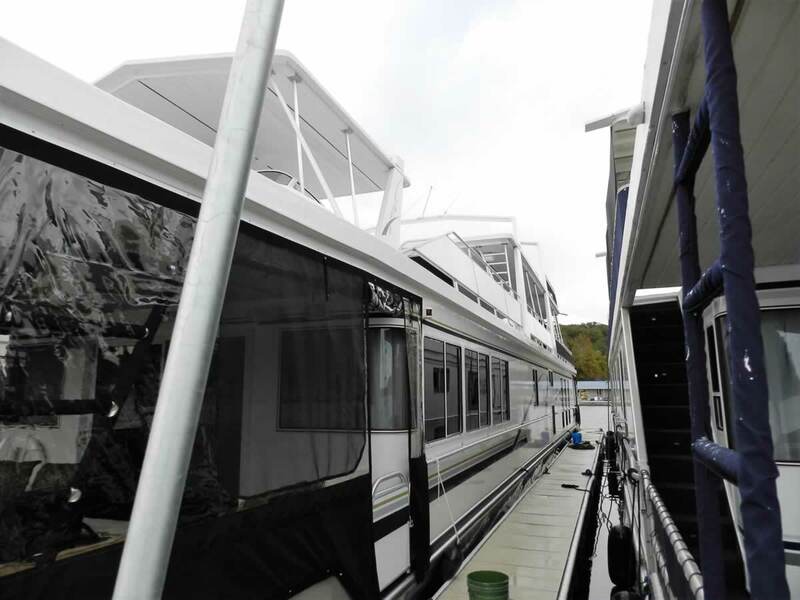 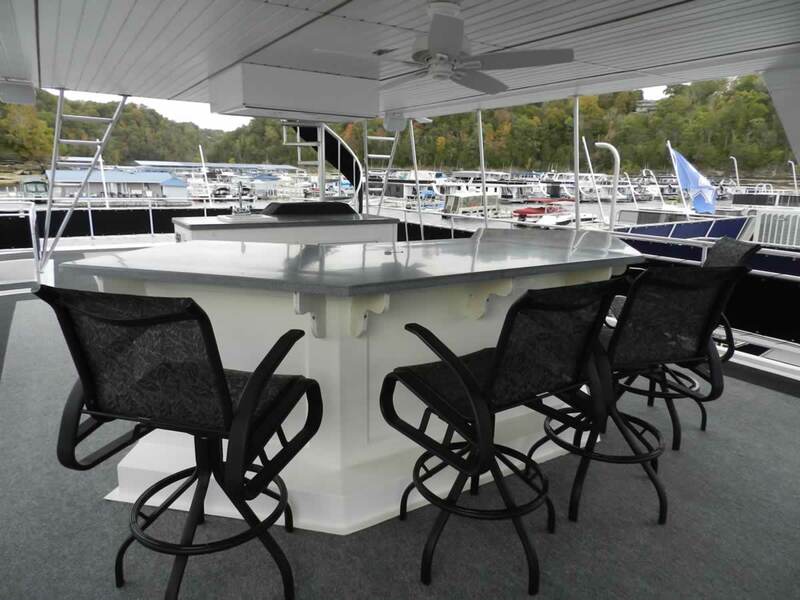 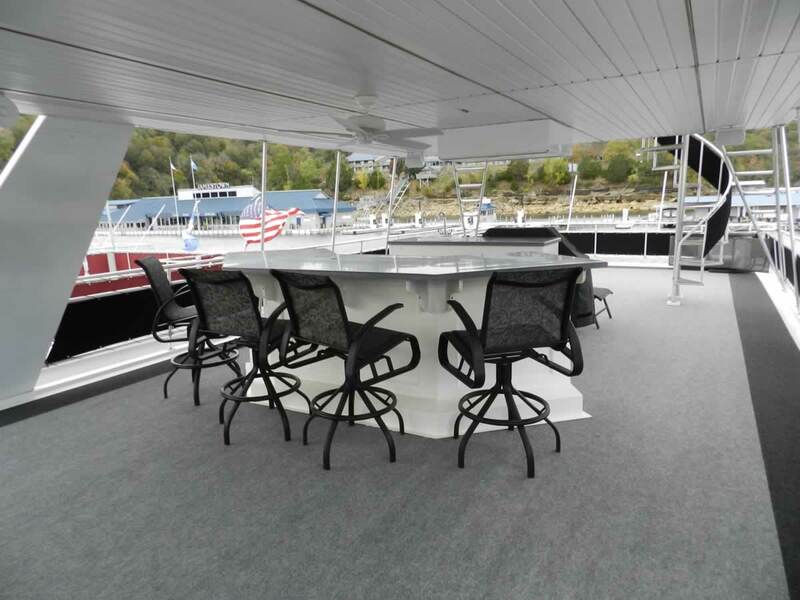 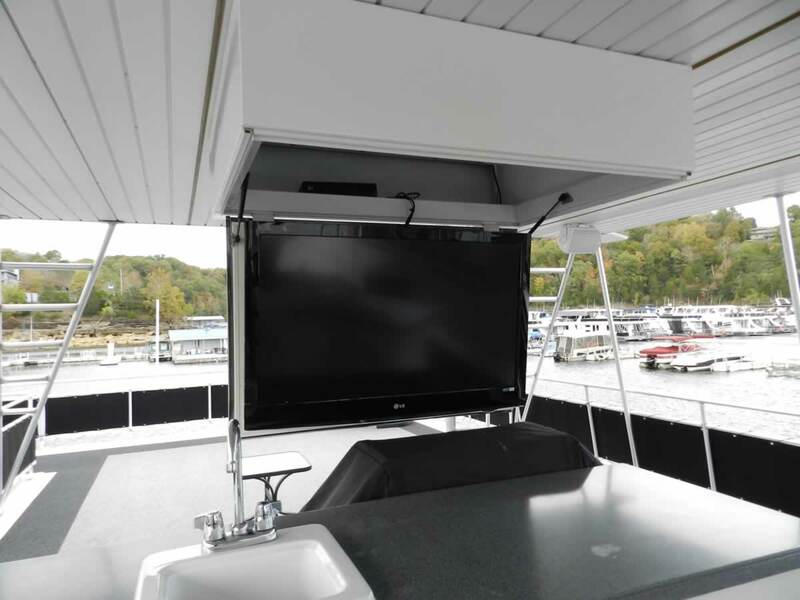 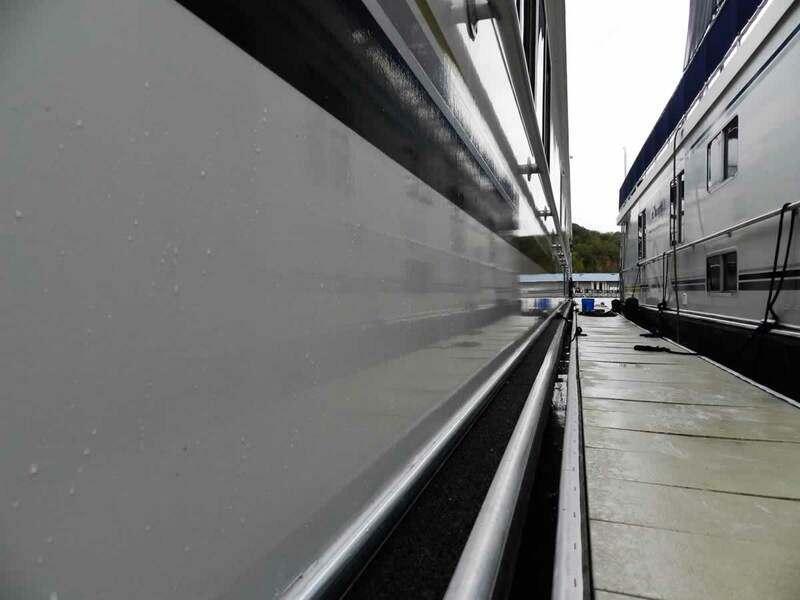 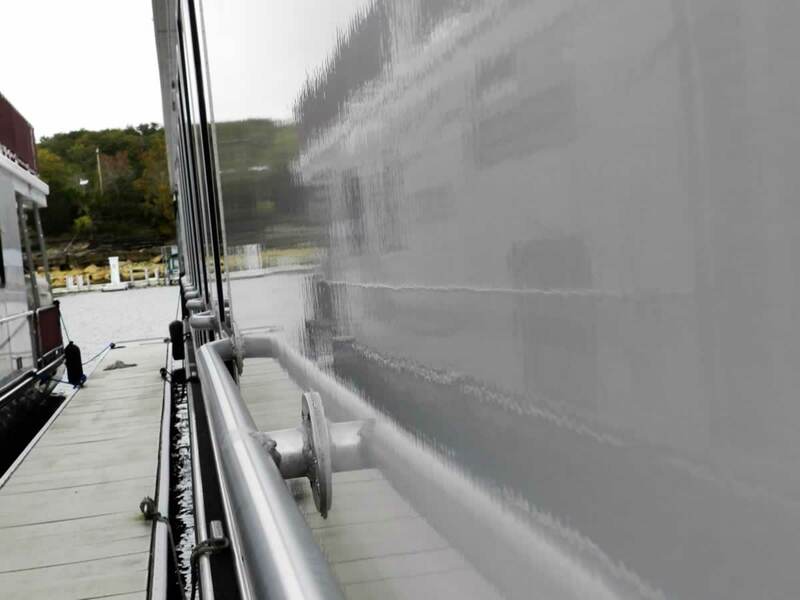 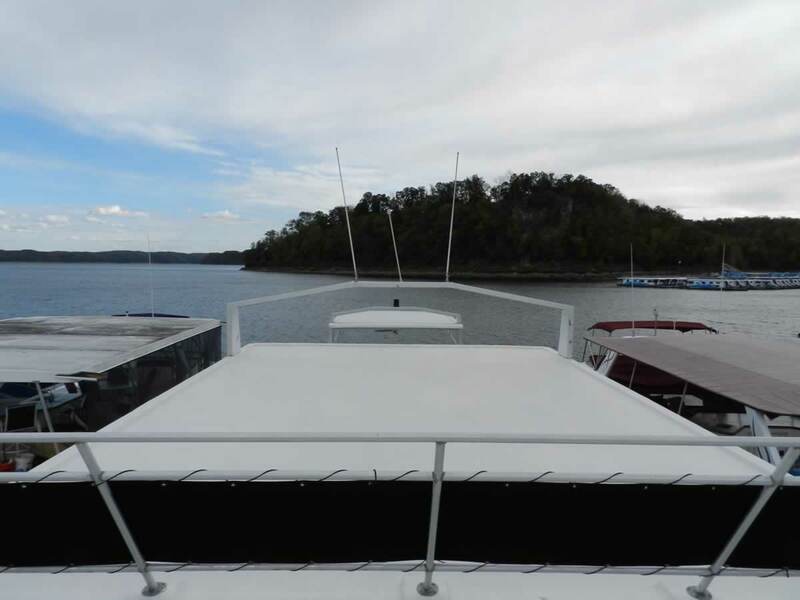 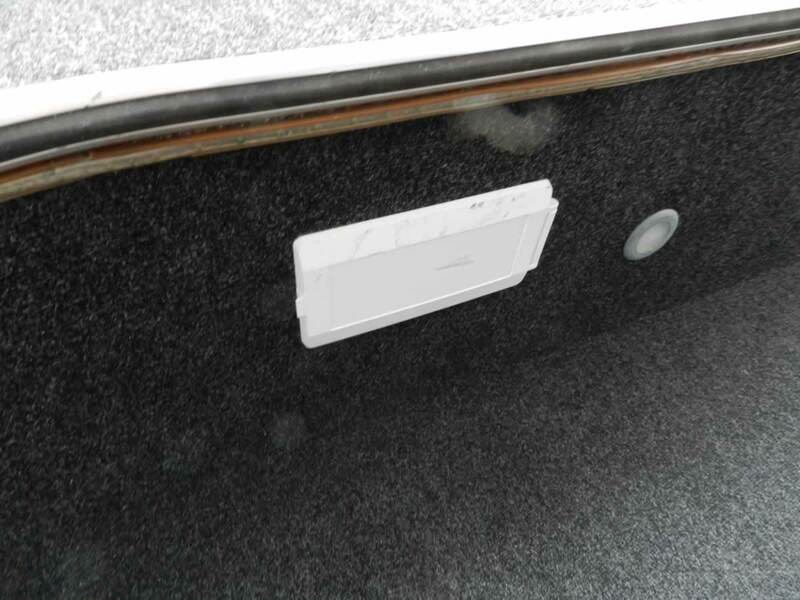 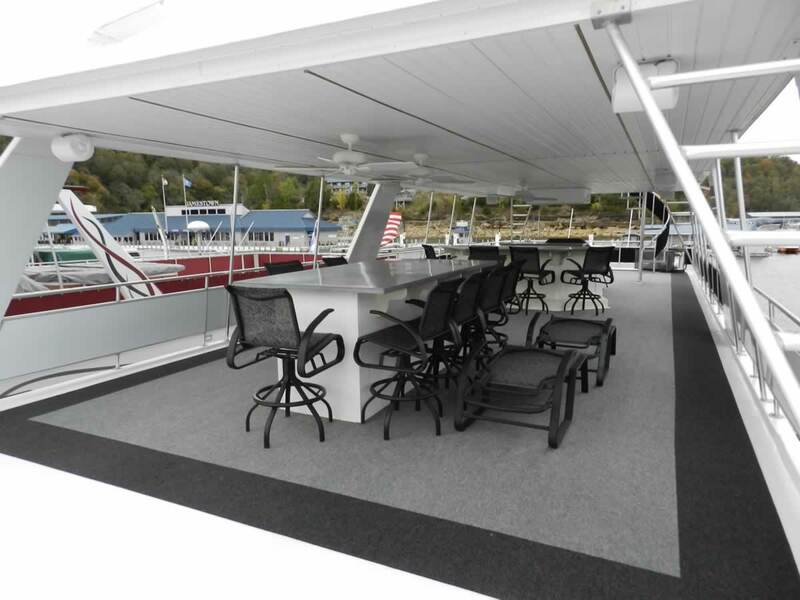 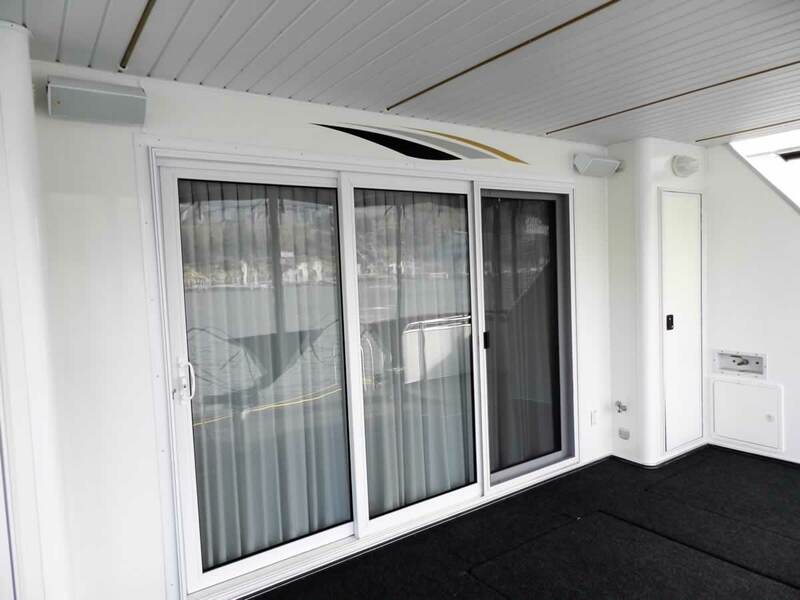 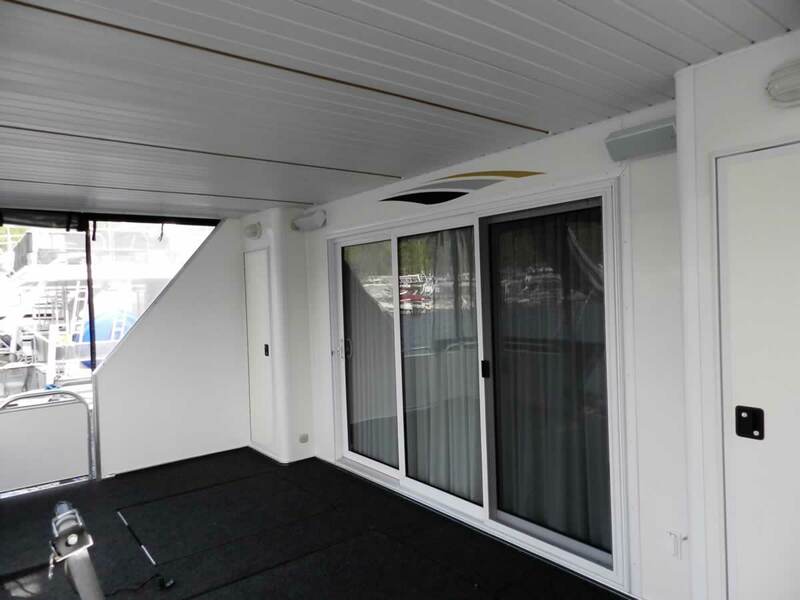 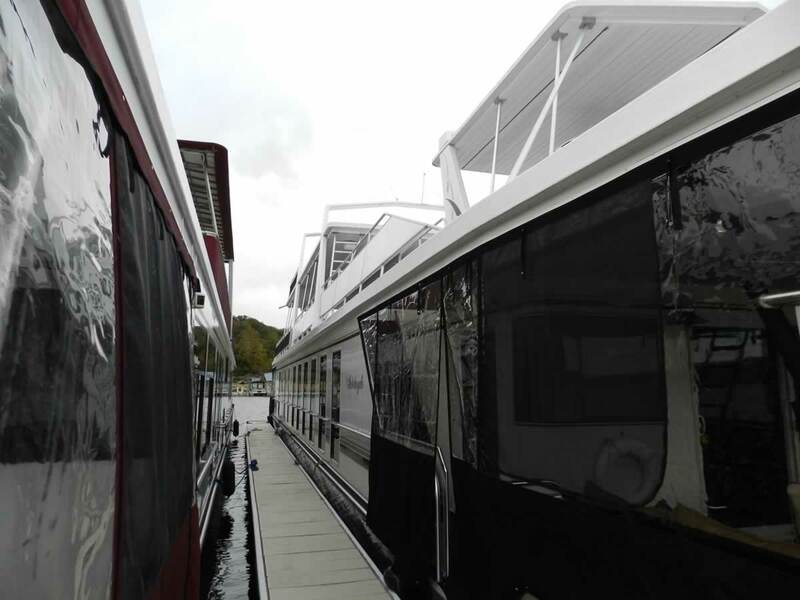 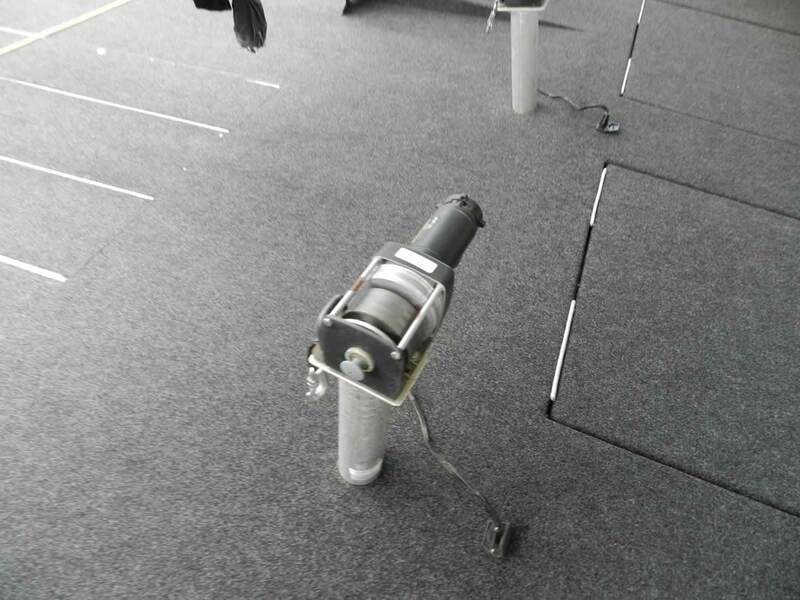 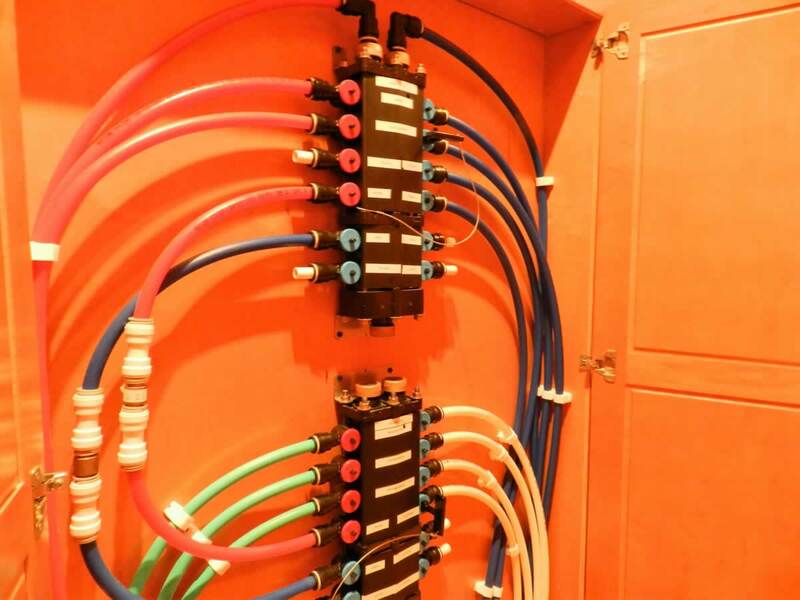 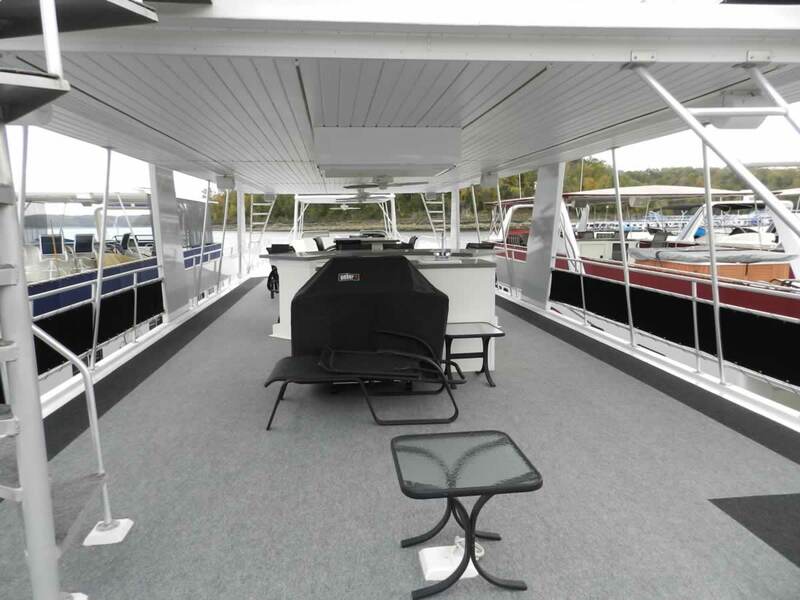 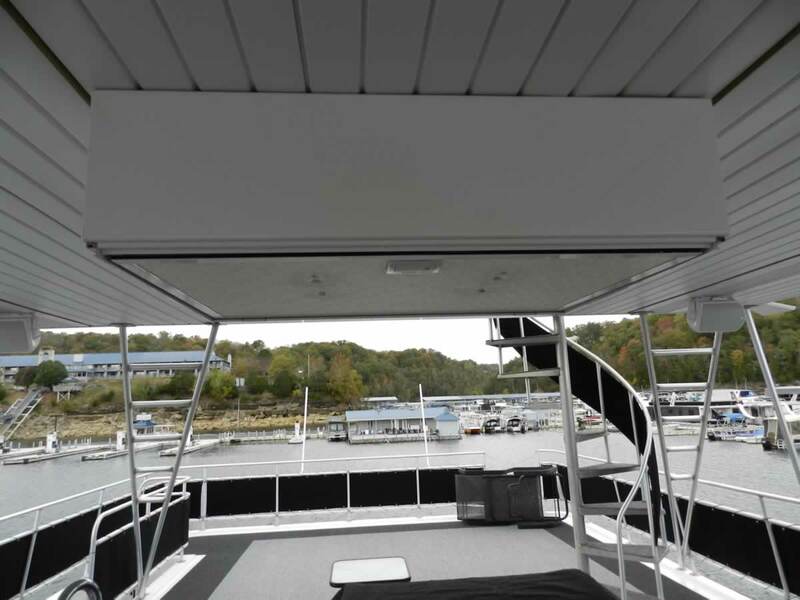 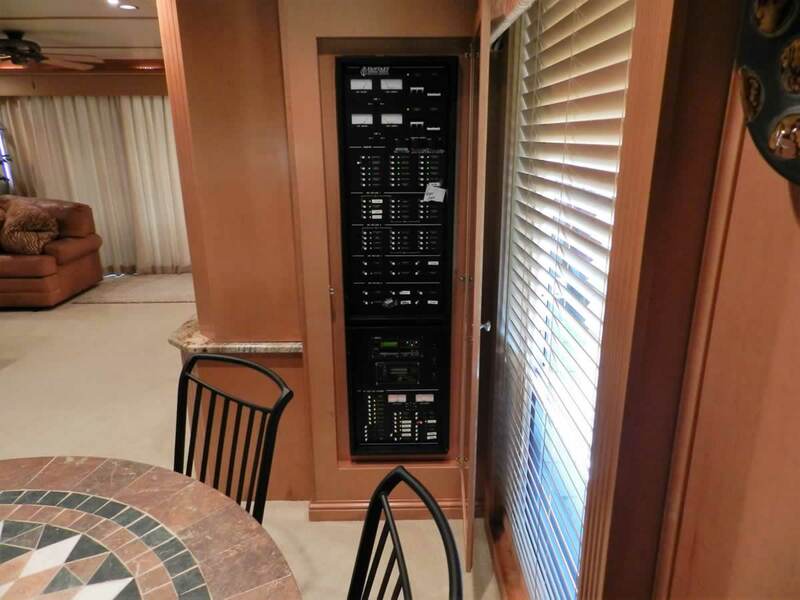 Both front and back decks come with full enclosures so that boating season is never really over. 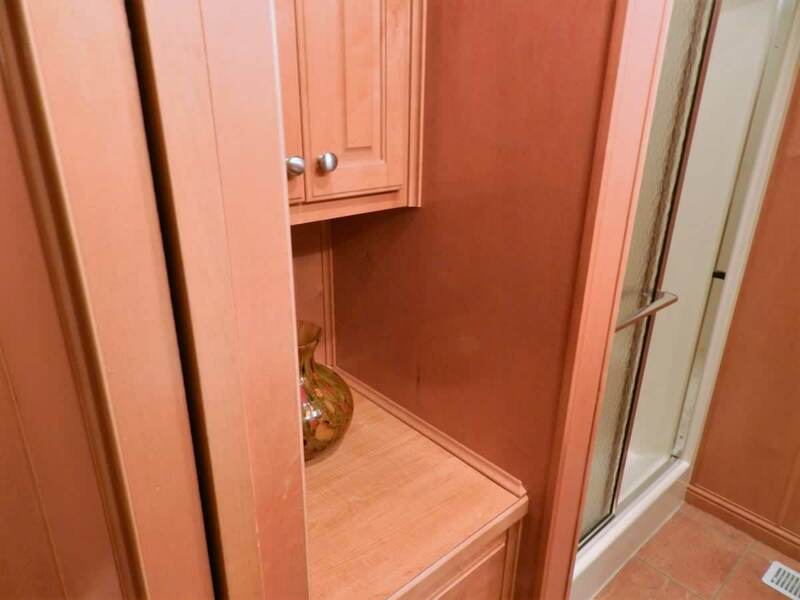 Enter the salon via the sliding glass door to find an elegant interior with honey maple wood and neutral colors. 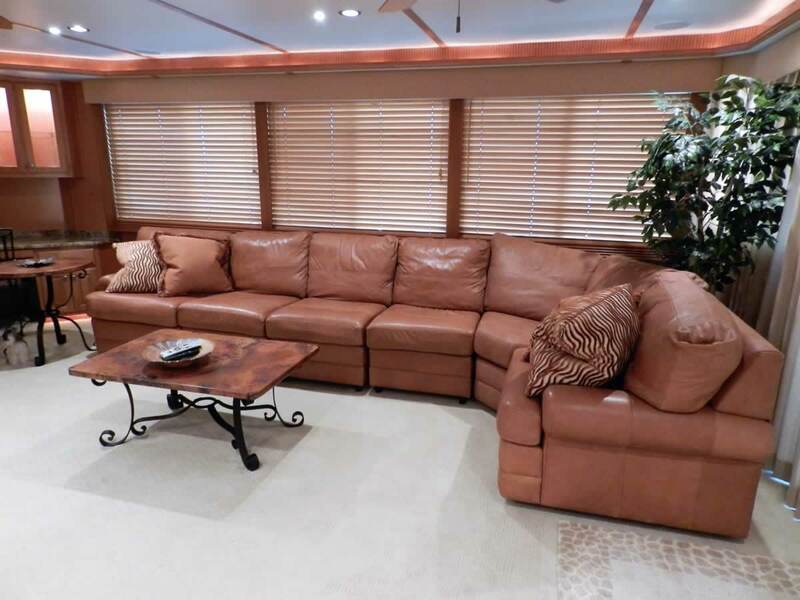 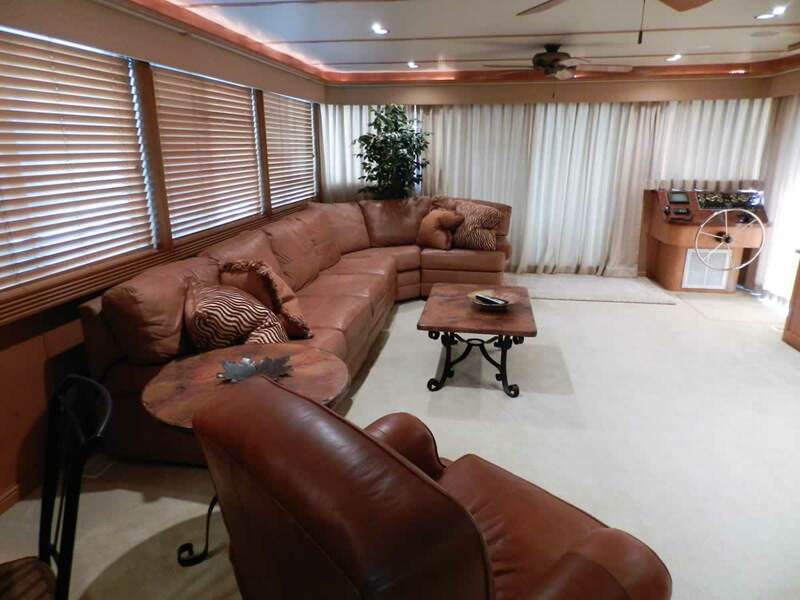 Large leather sectional couch and arm-chair provide plenty of seats to enjoy the fully appointed entertainment system. 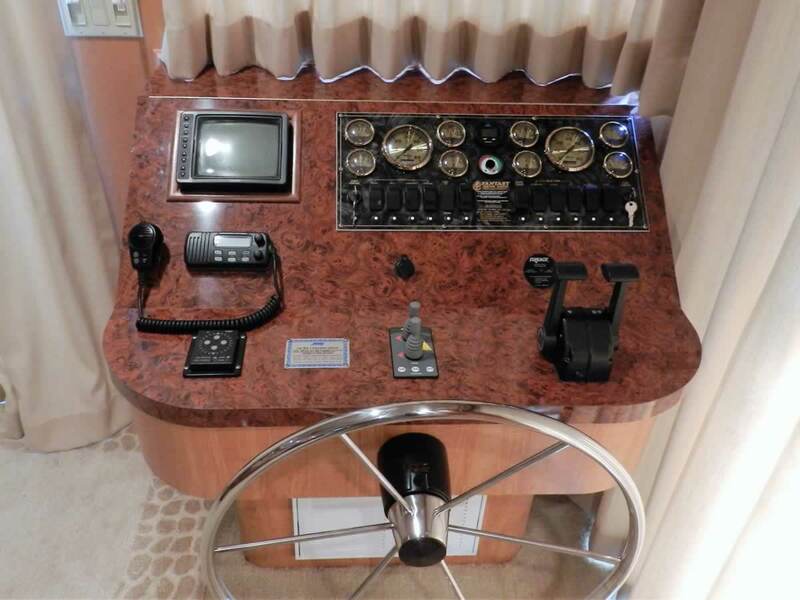 Starboard is the lower helm. 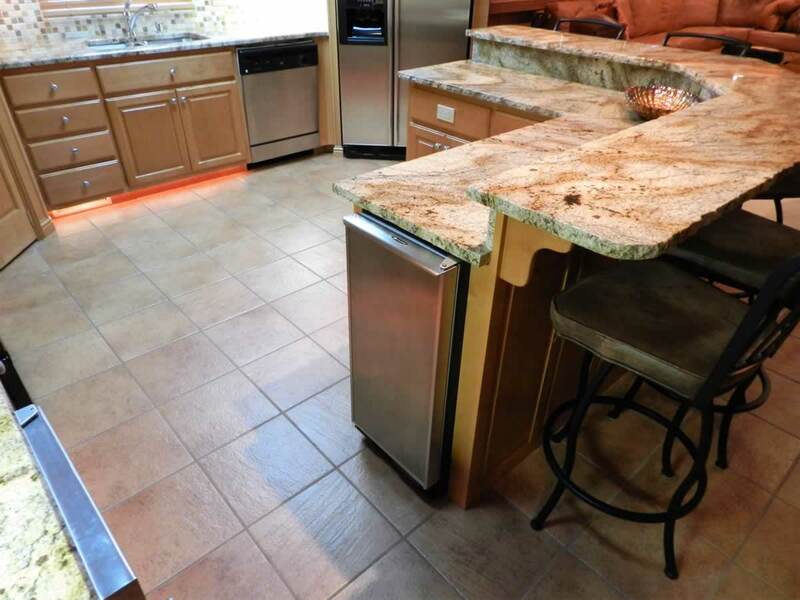 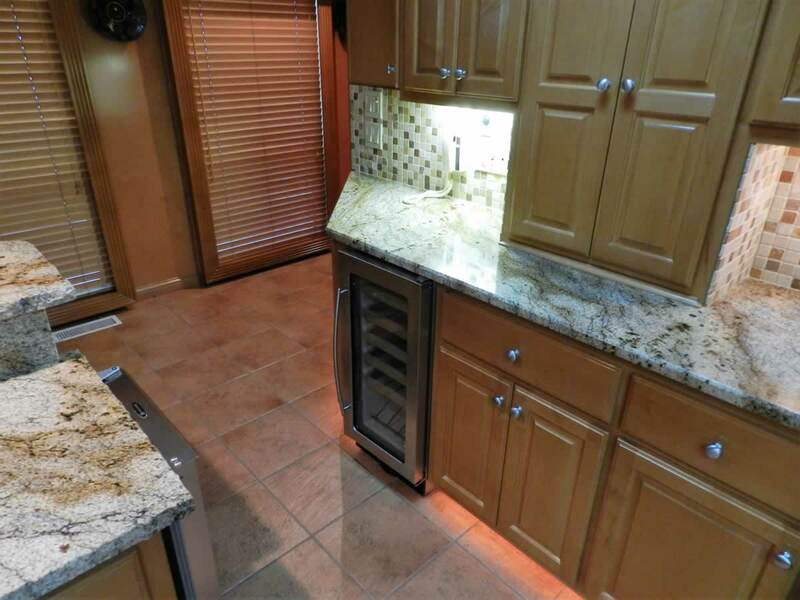 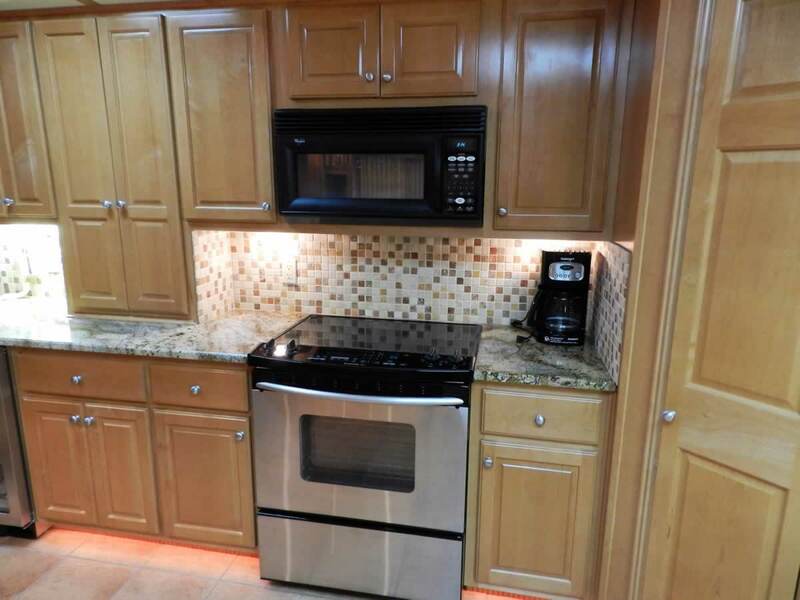 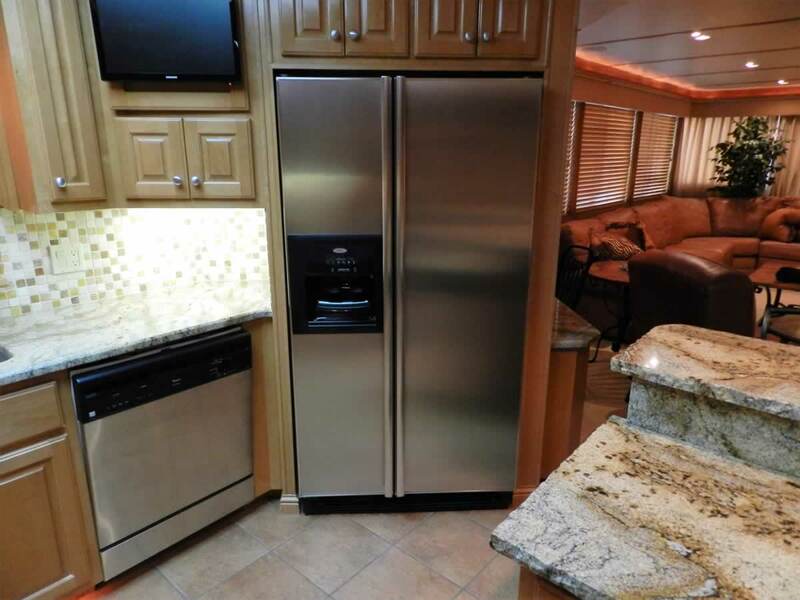 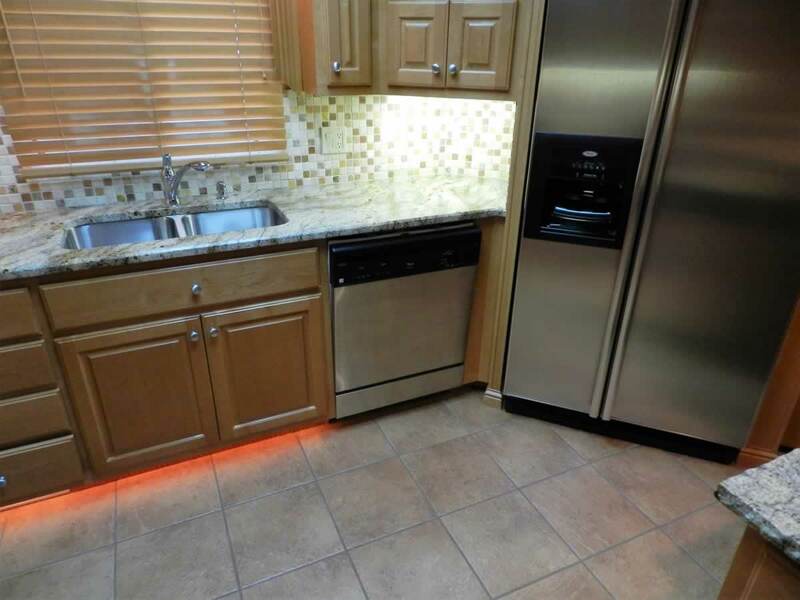 Head toward the galley to find all stainless appliances such as side by side refrigerator with ice/water in door, smooth top range, dishwasher, trash drawer, wet ice maker, and an under cabinet wine chiller. 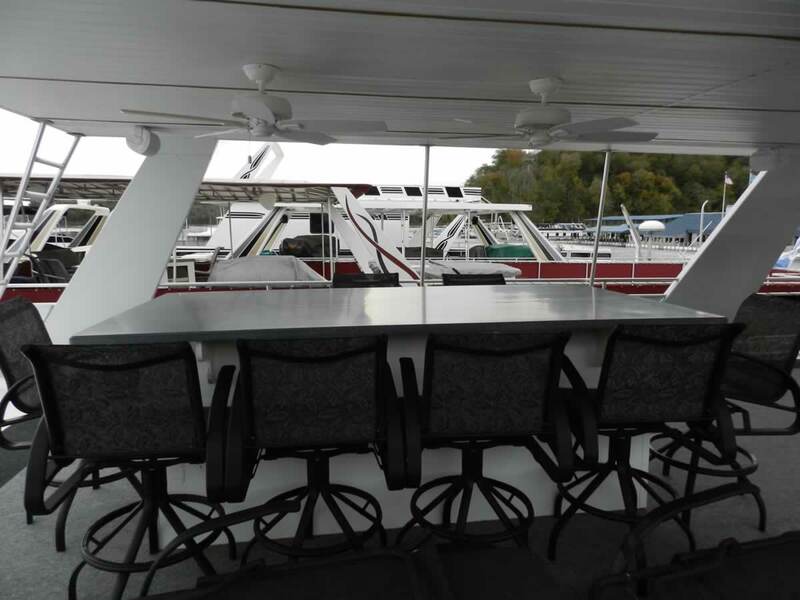 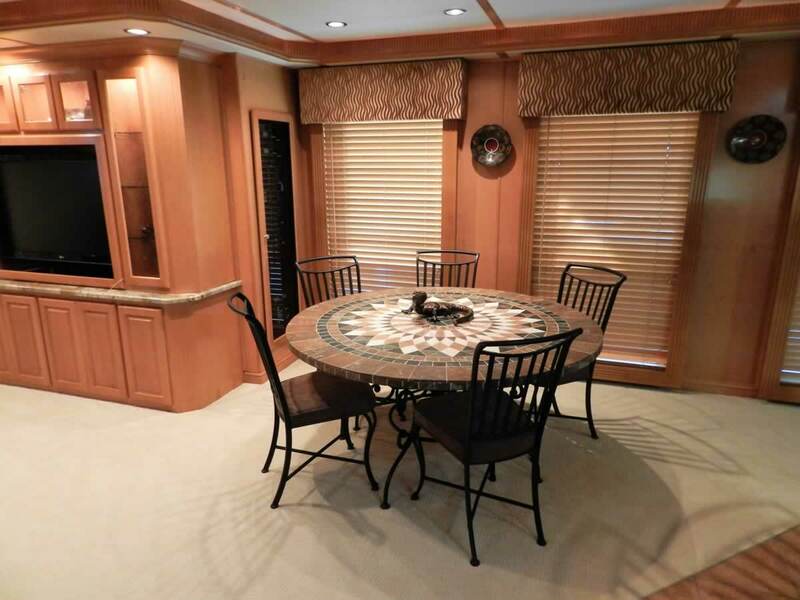 Spacious bar includes seating for 5 and round dining table has seating for 5. 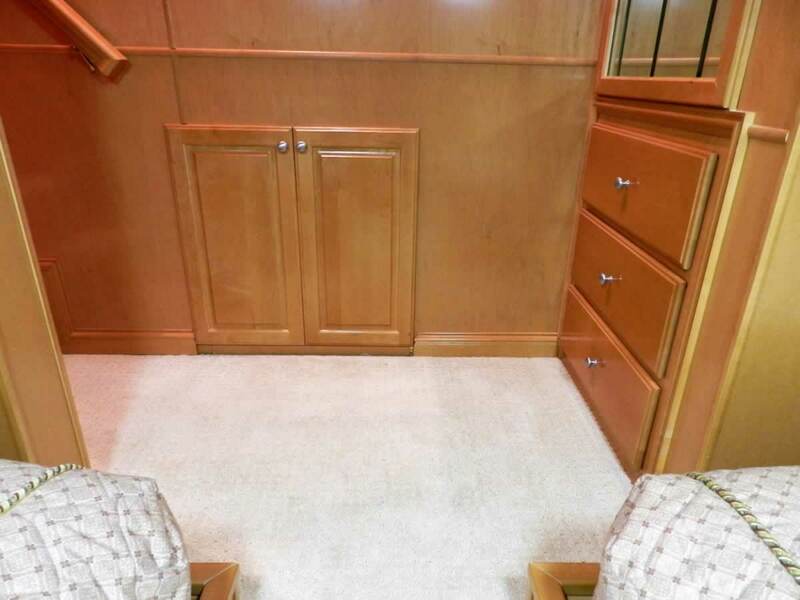 An added bonus is a corner desk area with chair. 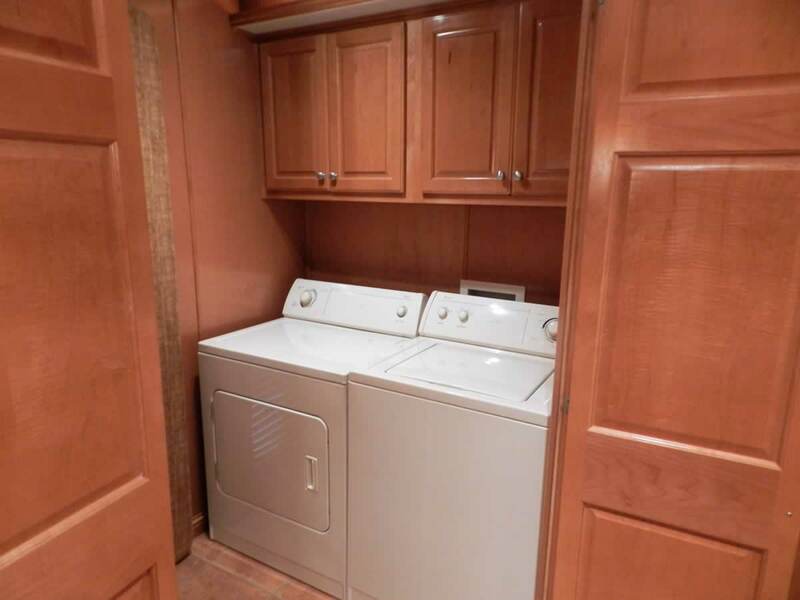 Head down the side hall of this z hall layout to starboard to find a separate laundry room with washer and dryer and extra storage. 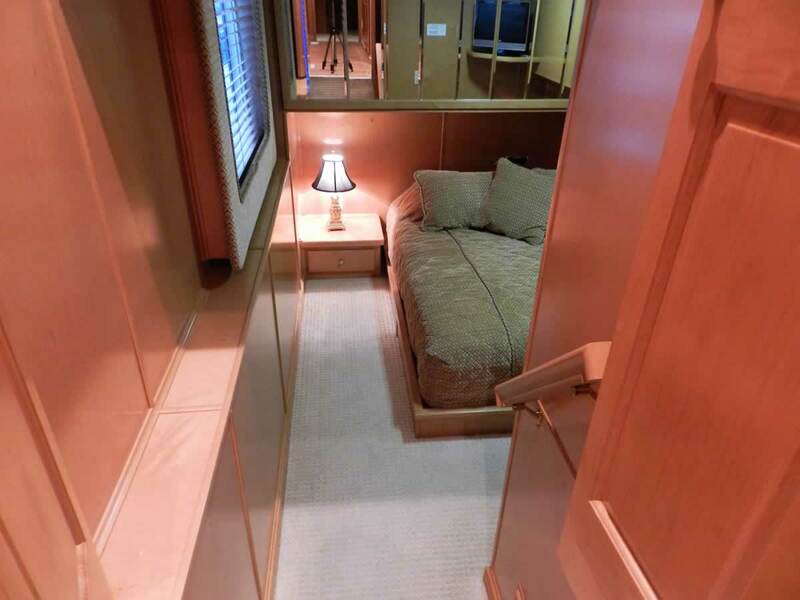 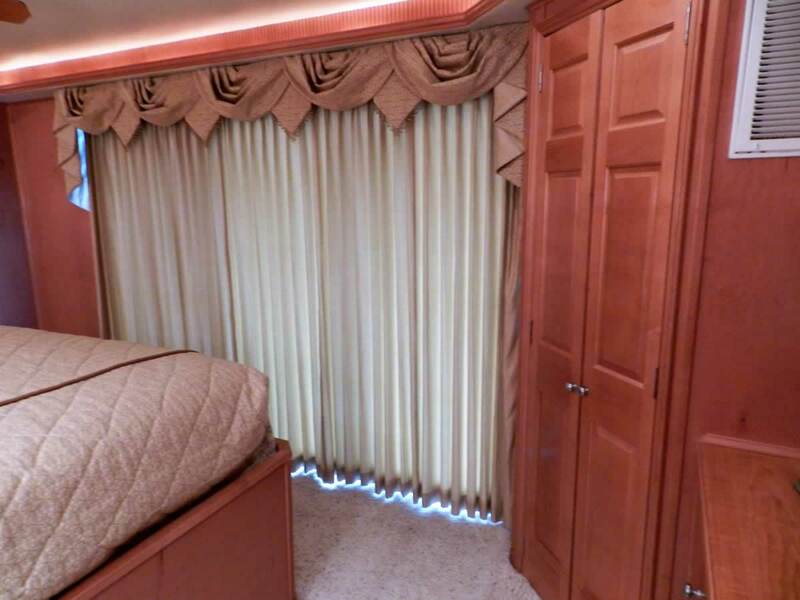 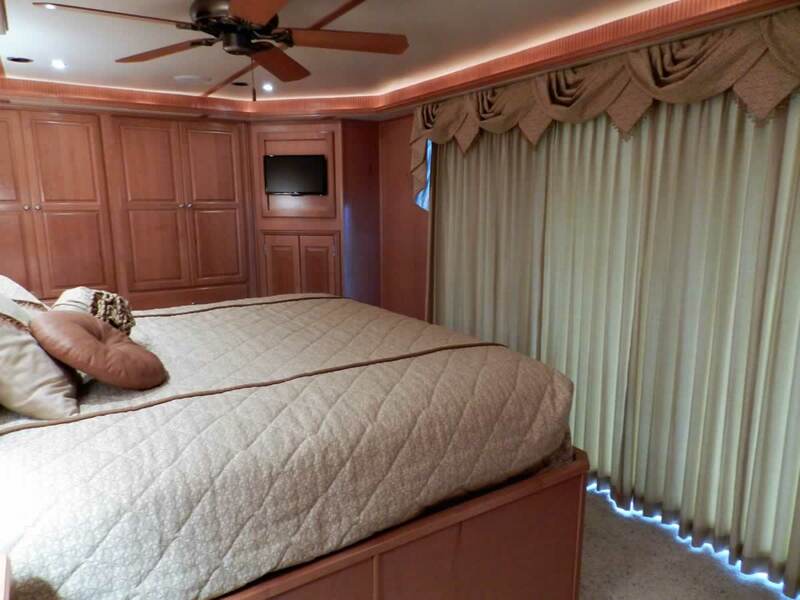 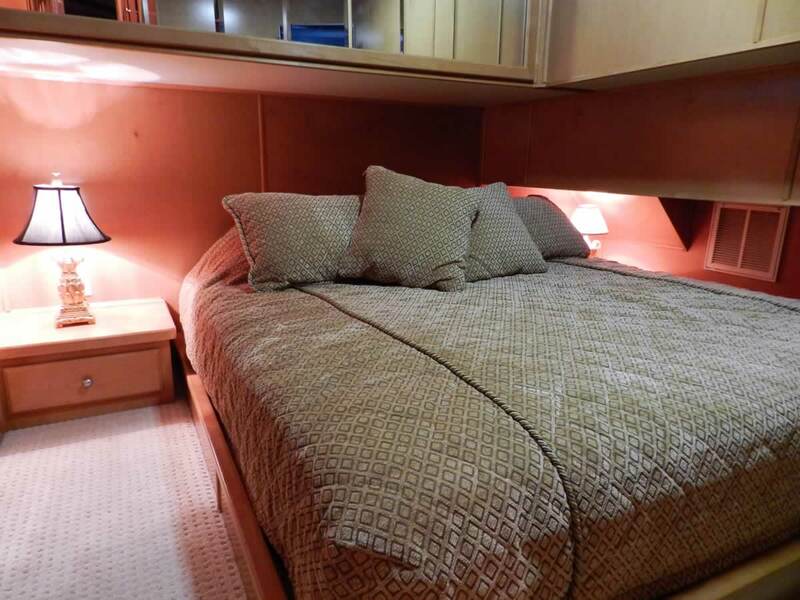 To port is a private suite VIP stateroom with king size bed, closet and TV. 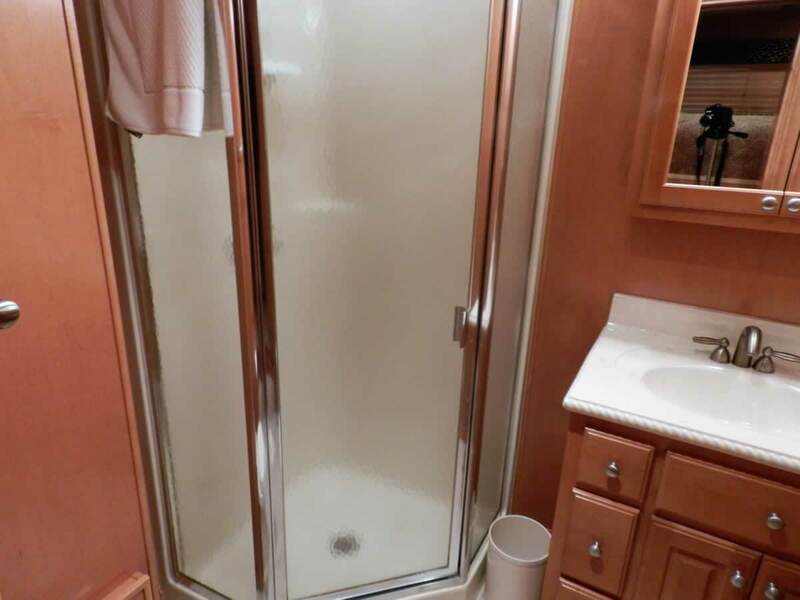 Private bath includes neo-angle shower, vanity and head. 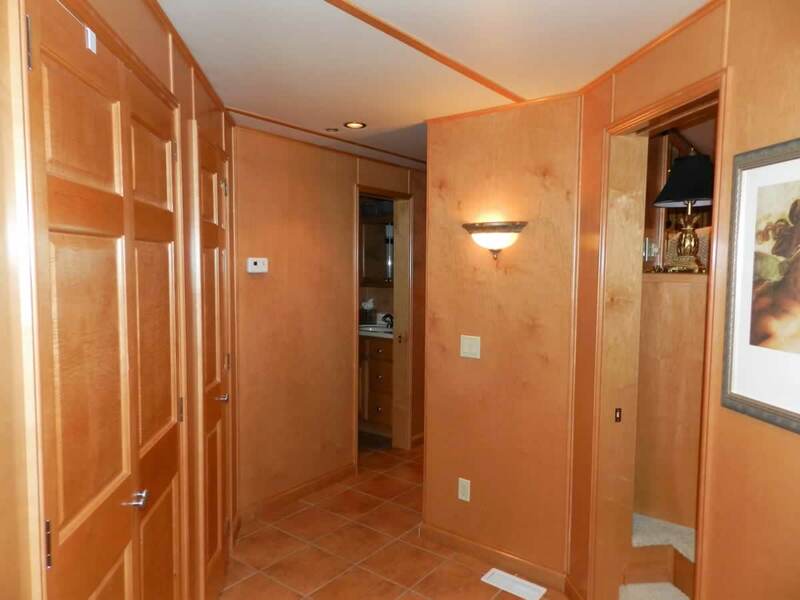 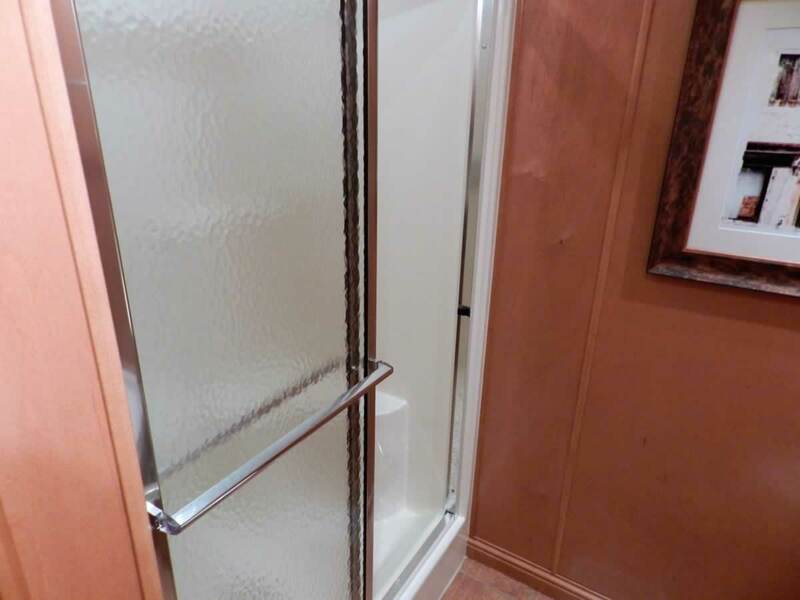 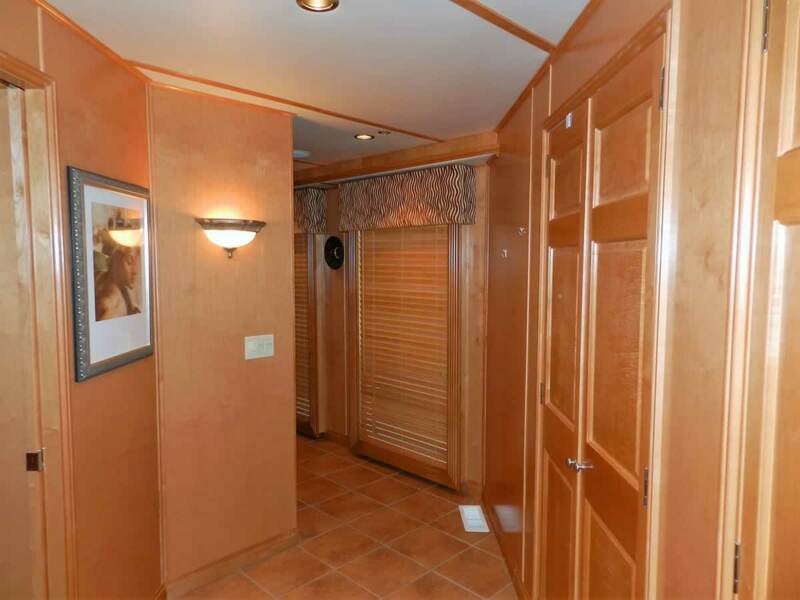 On down the hall to find a full guest bath with shower, vanity and head. 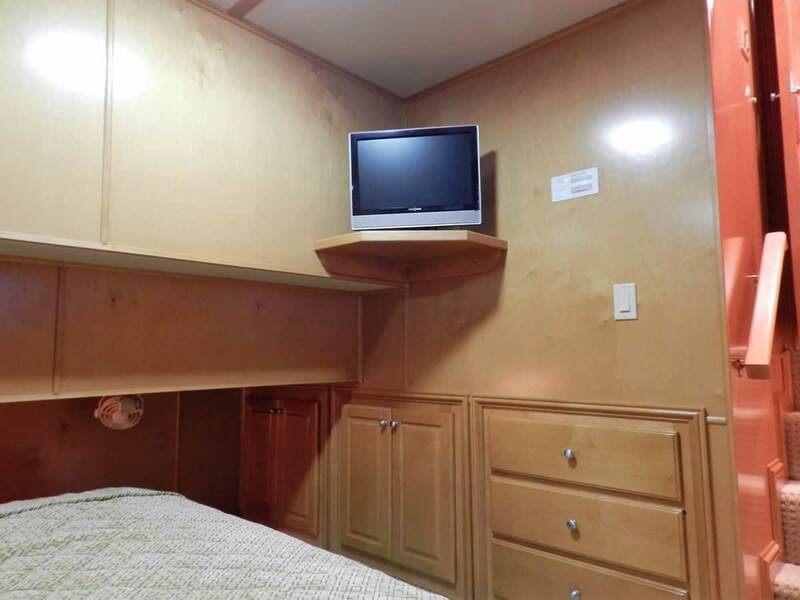 Forward cuddy has a king bed, drawer storage, and TV. 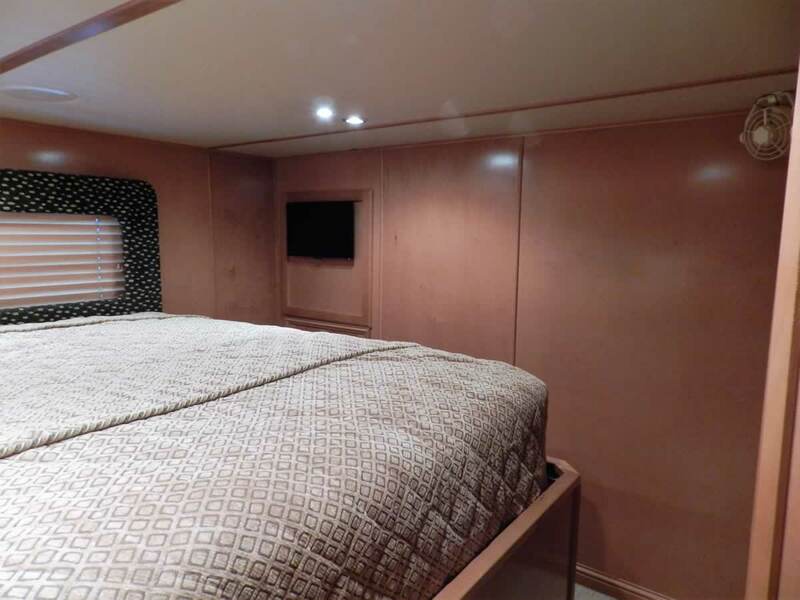 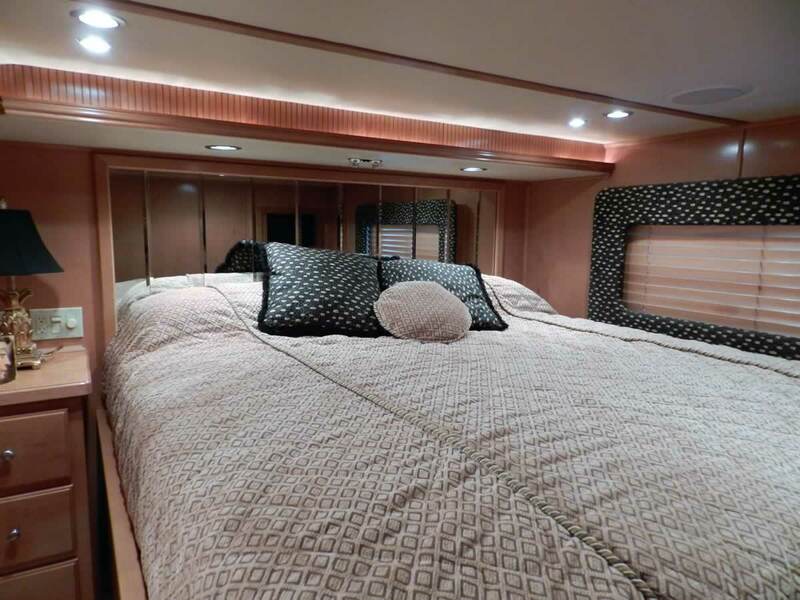 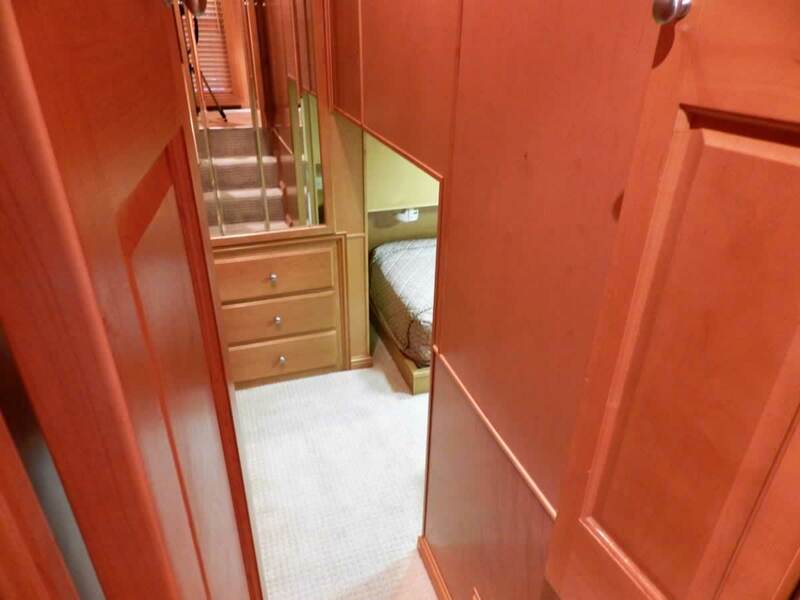 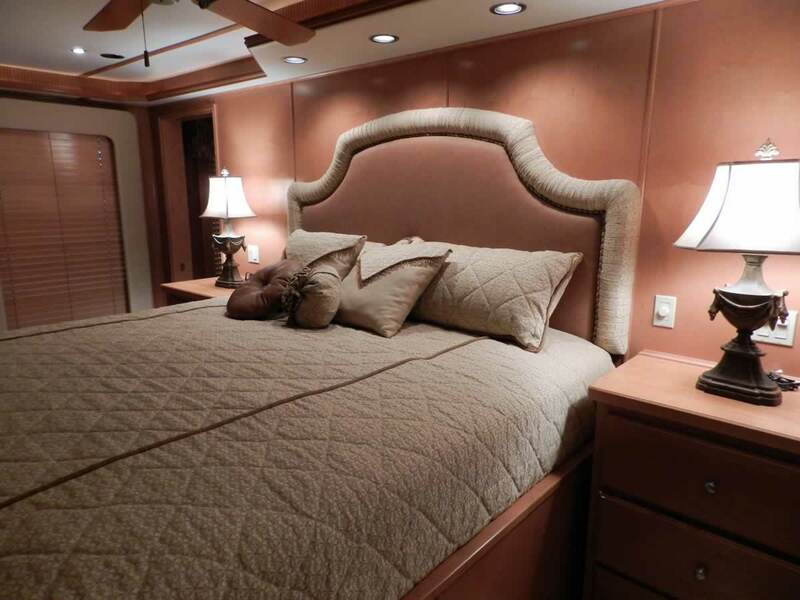 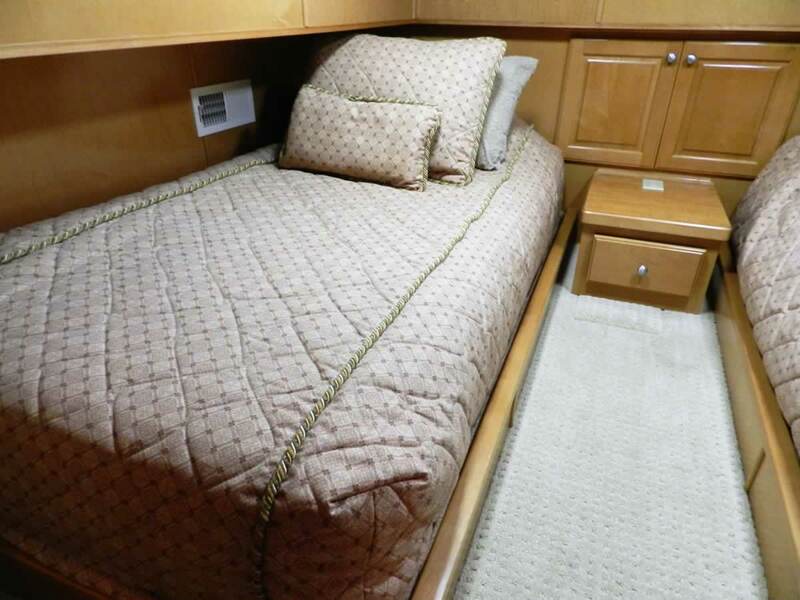 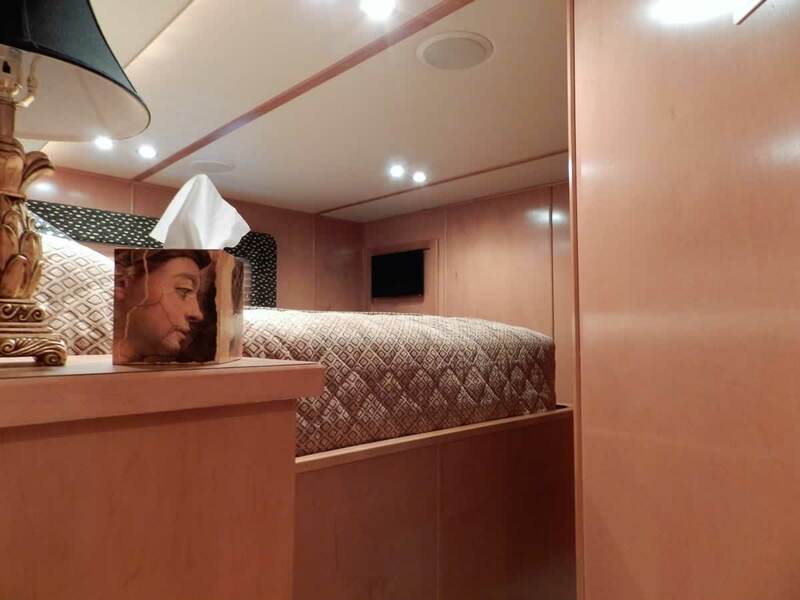 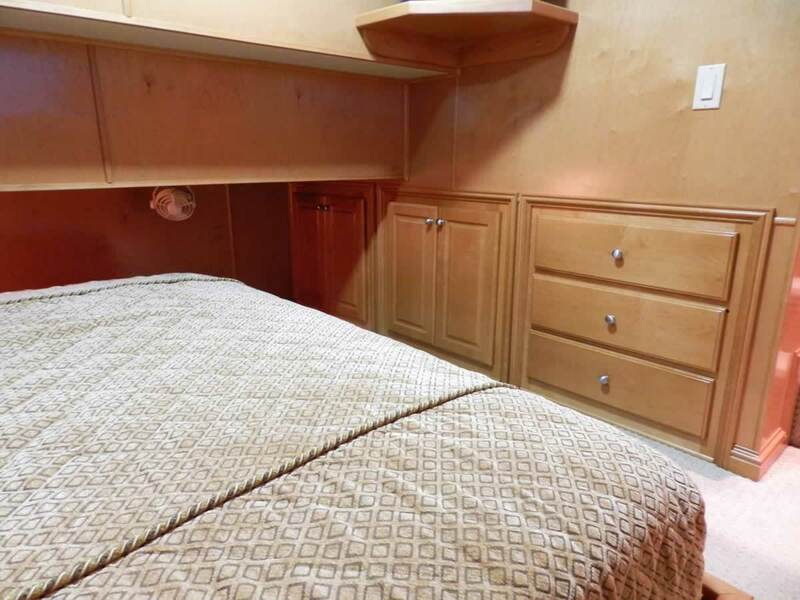 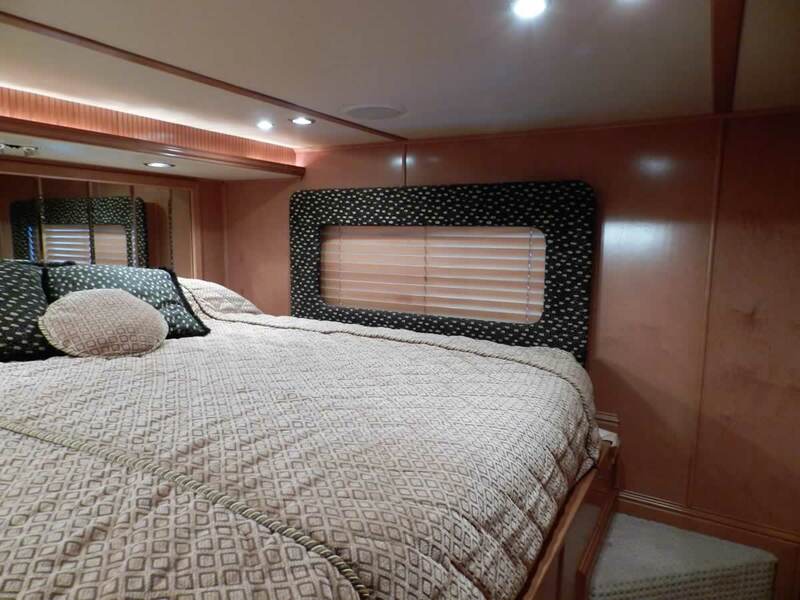 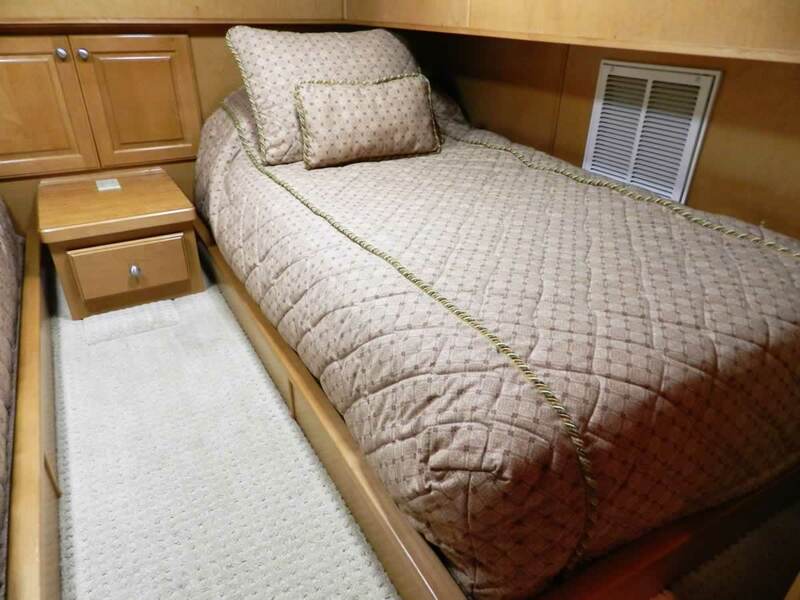 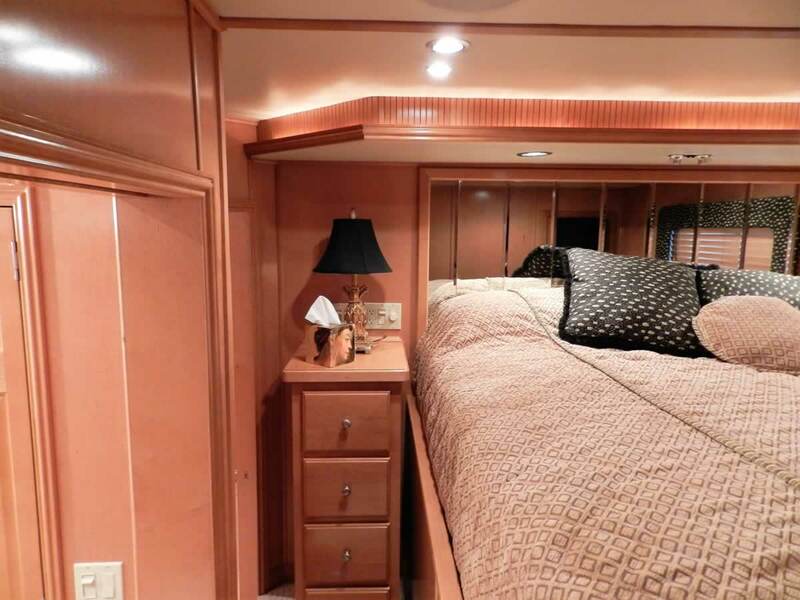 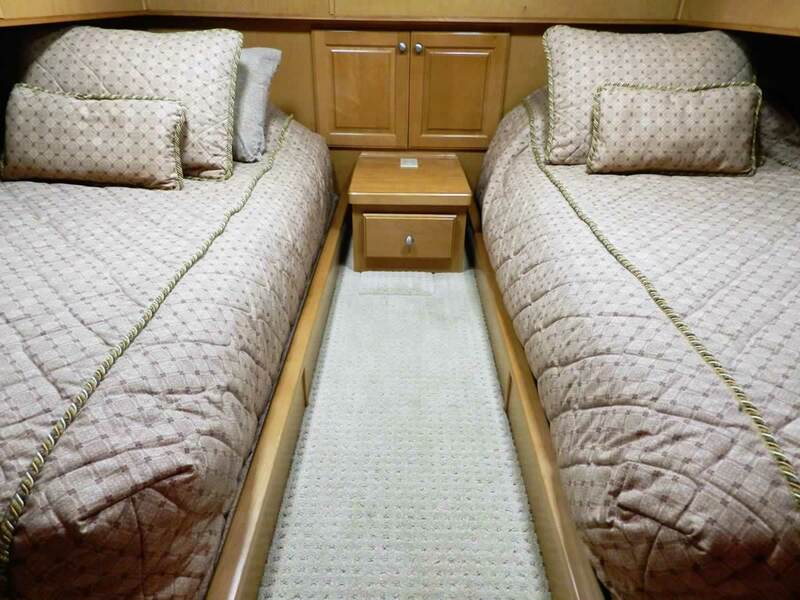 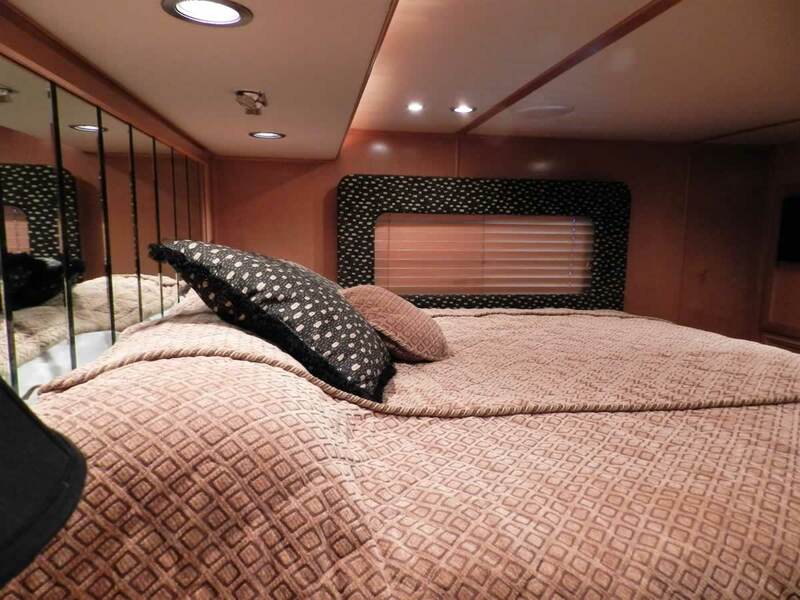 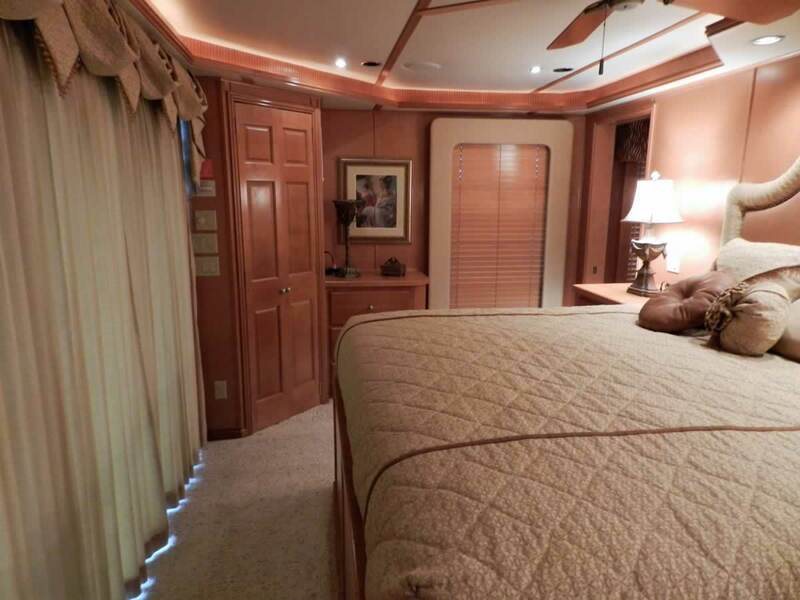 Aft cuddy has twin beds, drawer storage, and hull access. 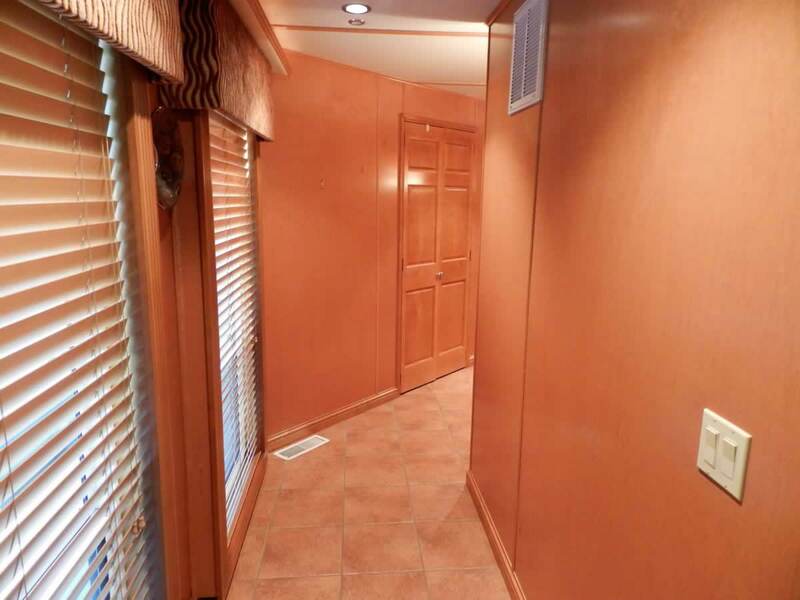 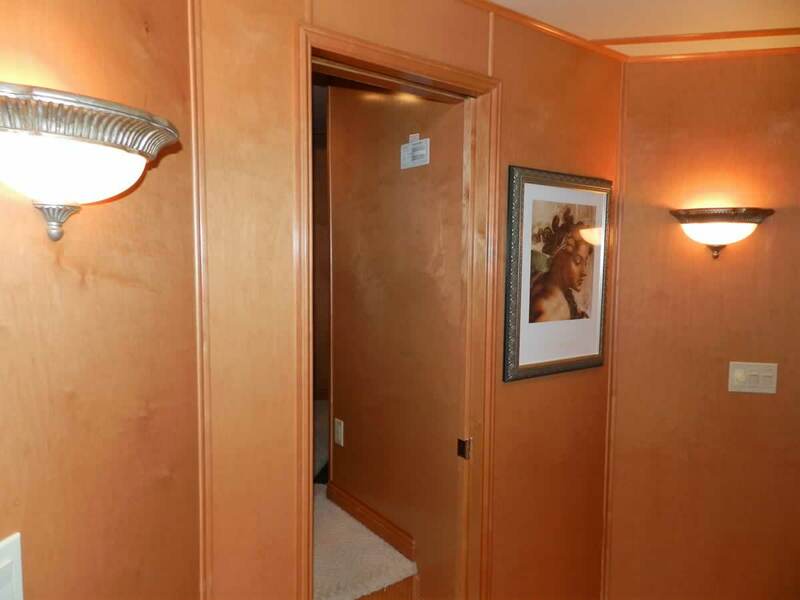 Hall ends in the comfy king master suite with private bath. 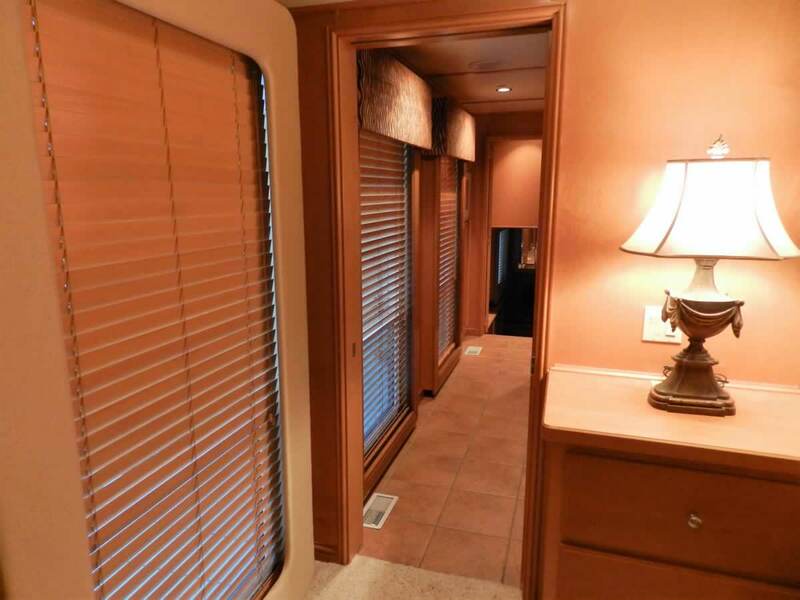 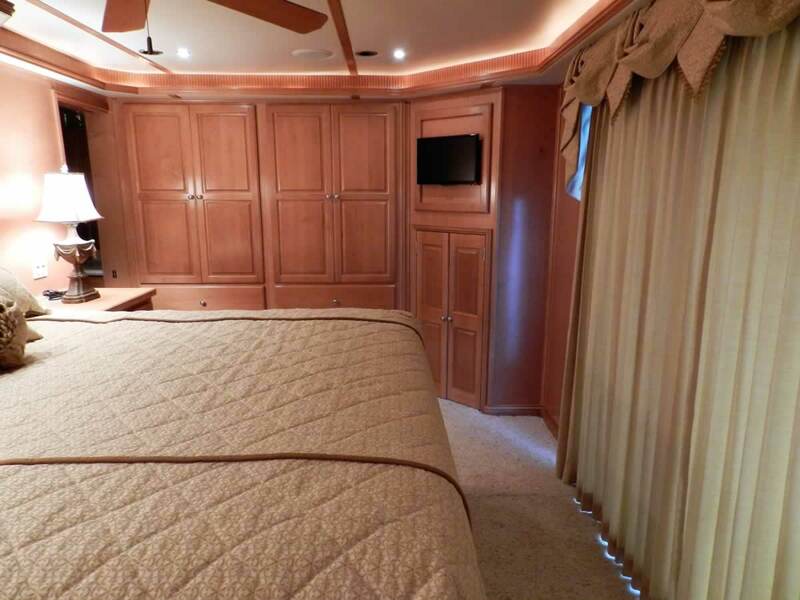 Master suite includes closets, numerous drawer storage, and TV. 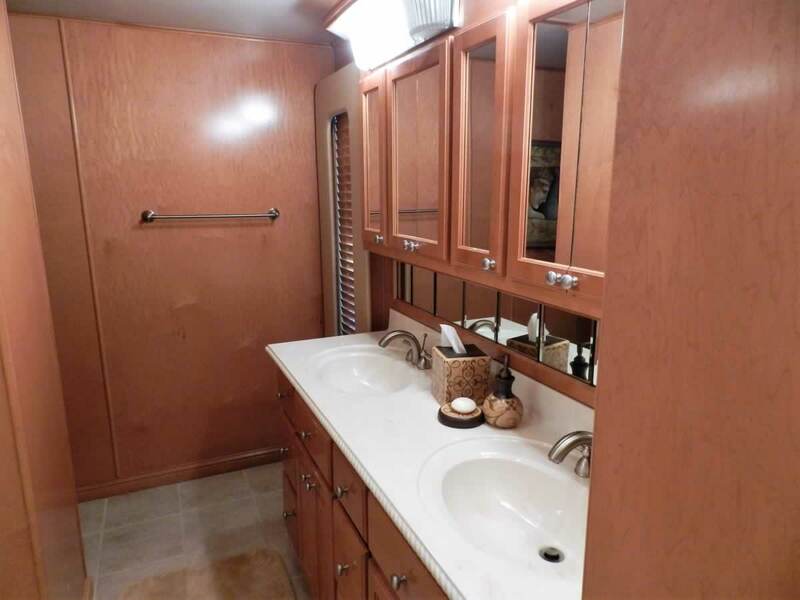 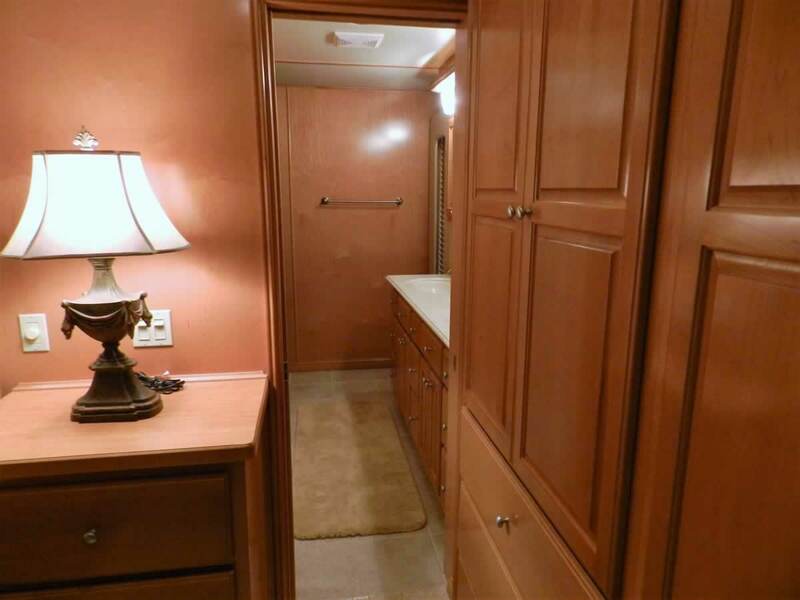 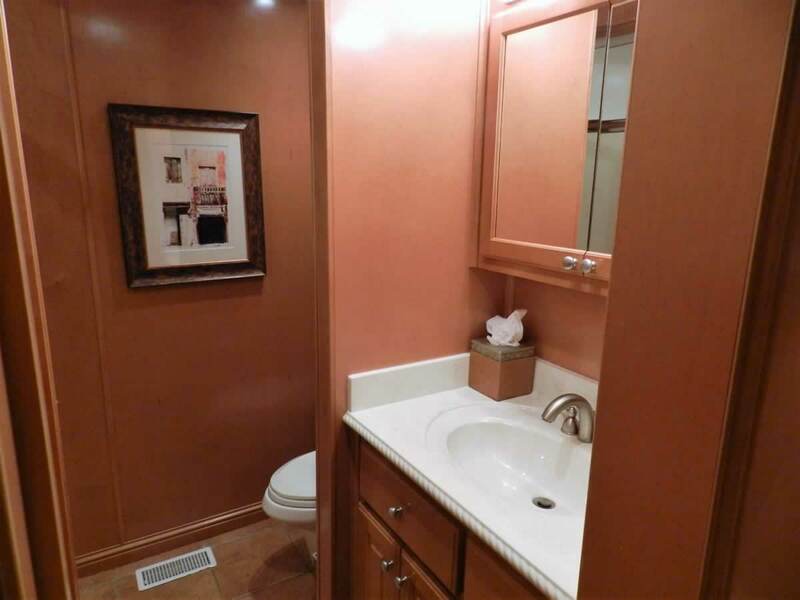 Master bath includes shower, his and her vanity, linen closet and head. 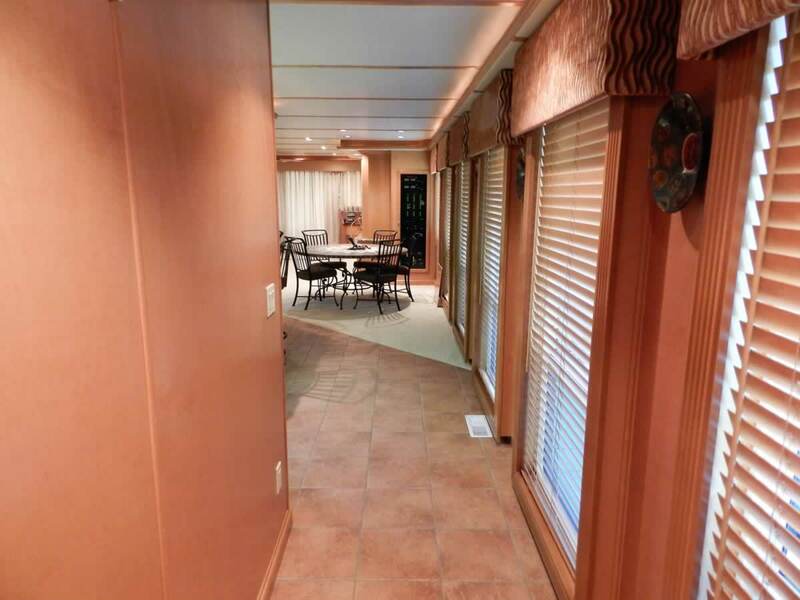 Step through the sliding glass door onto the back deck. 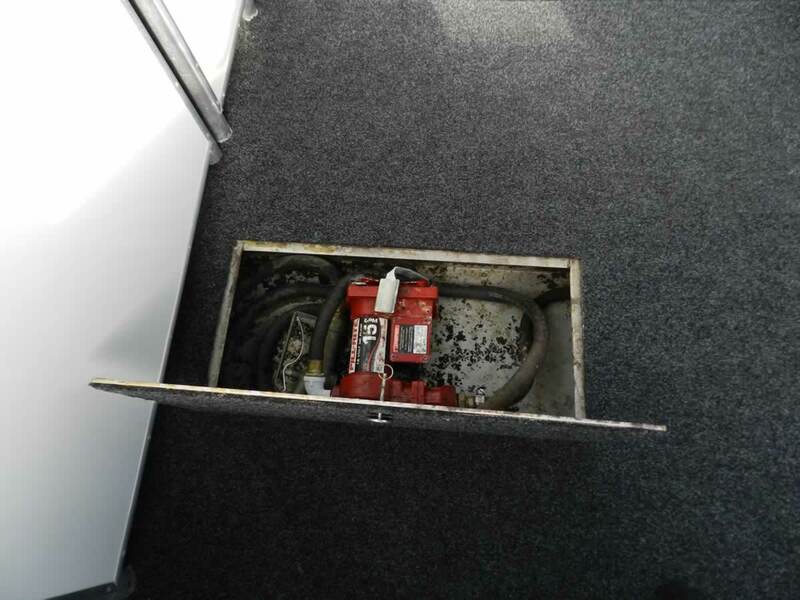 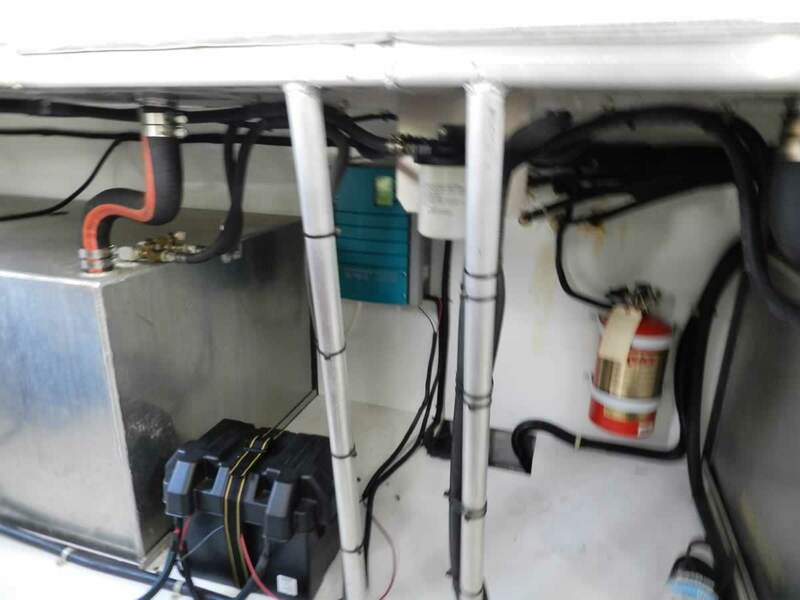 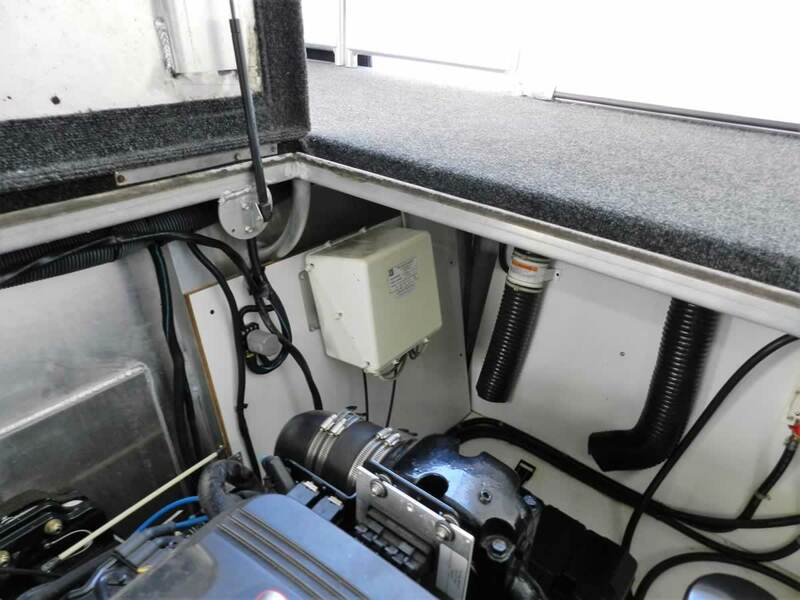 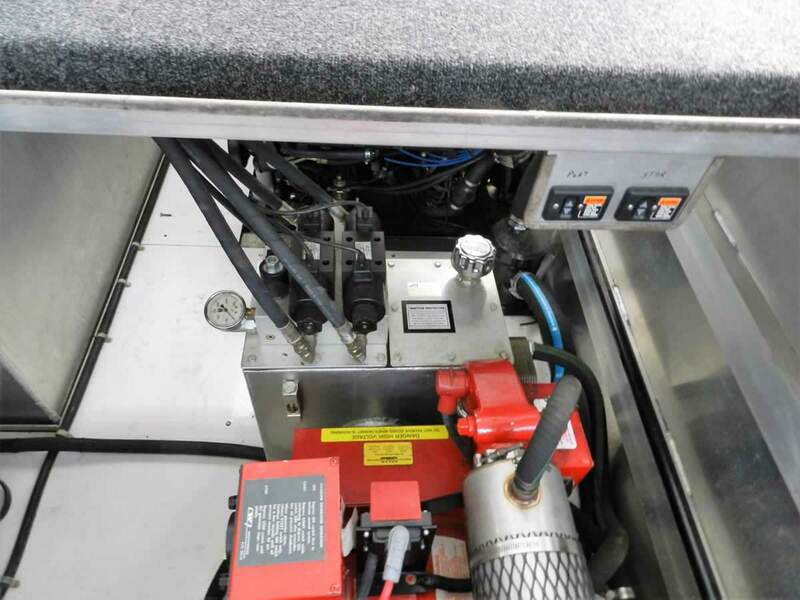 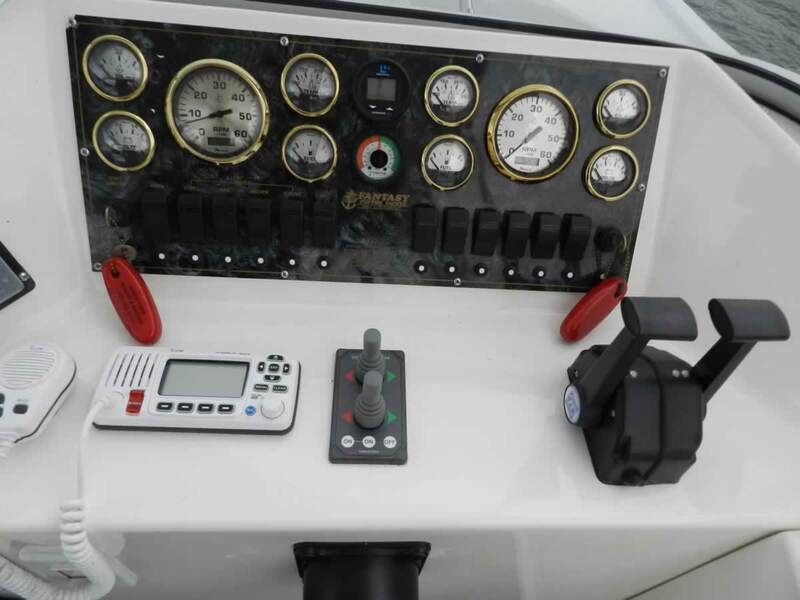 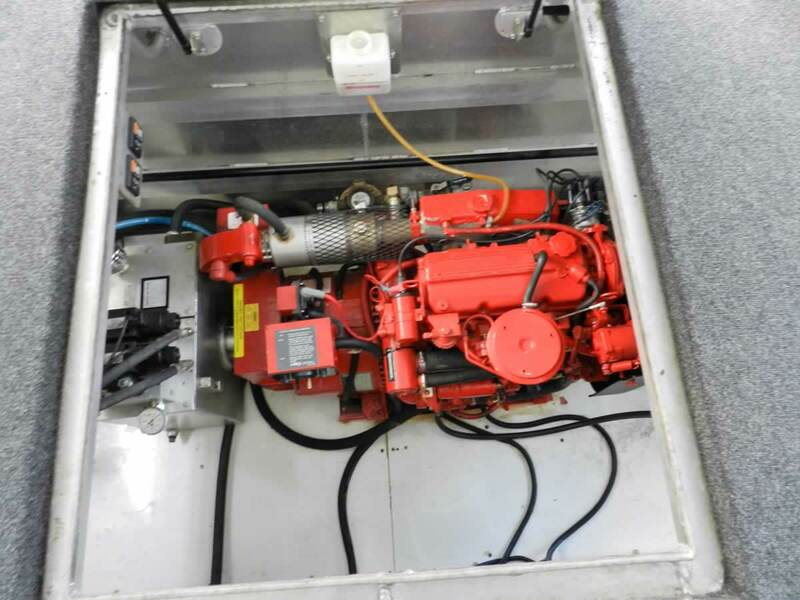 Three hatches provide access to engines and generator. 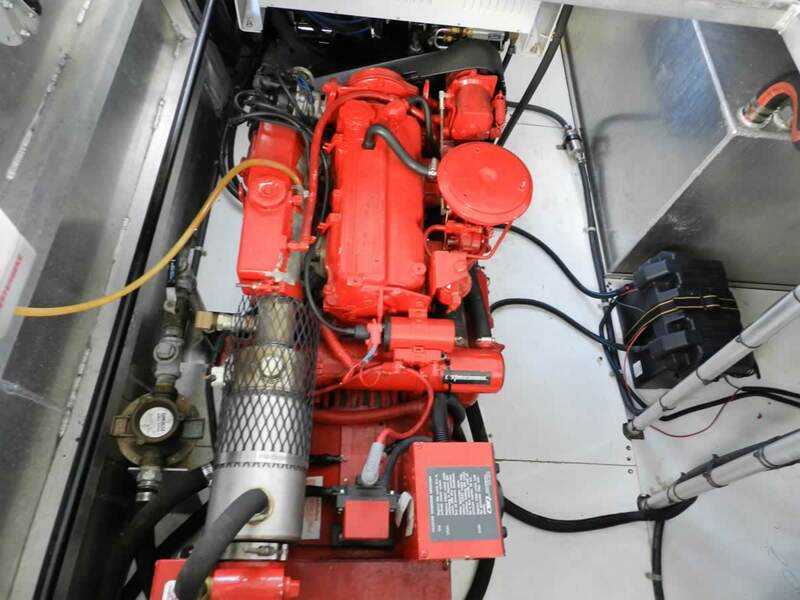 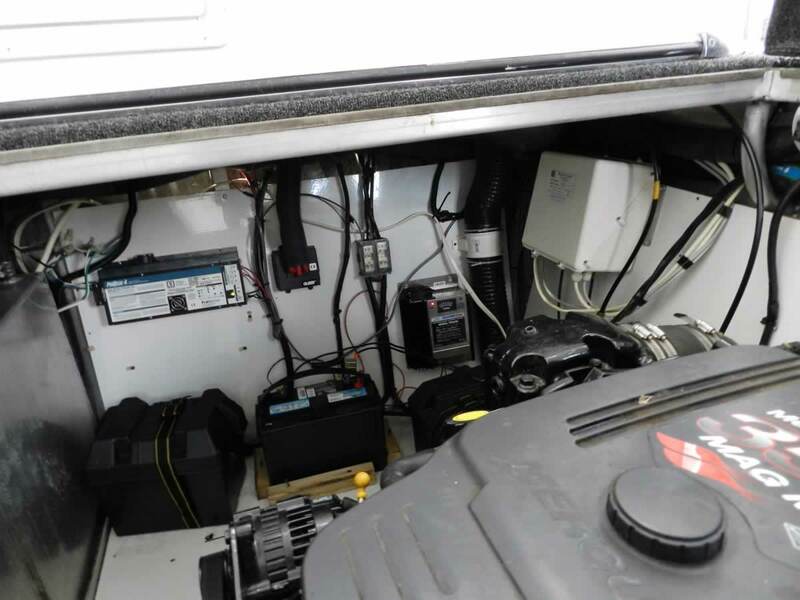 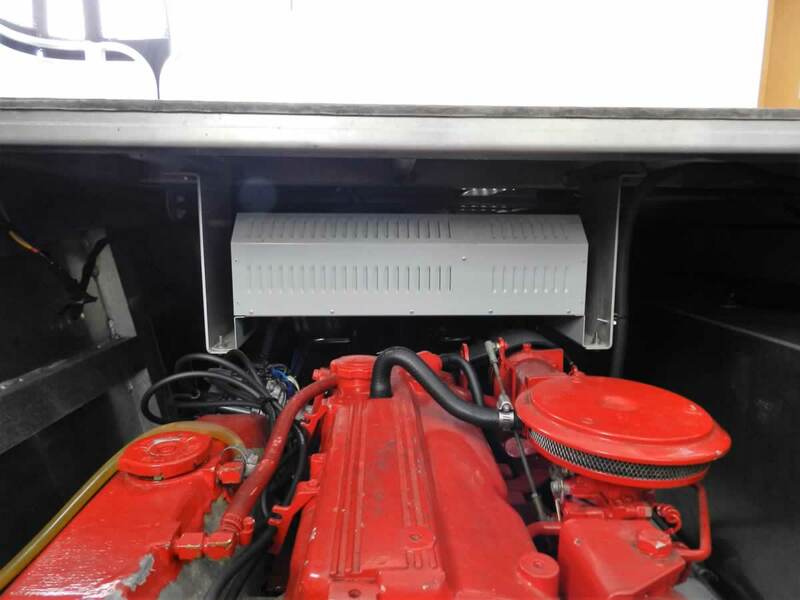 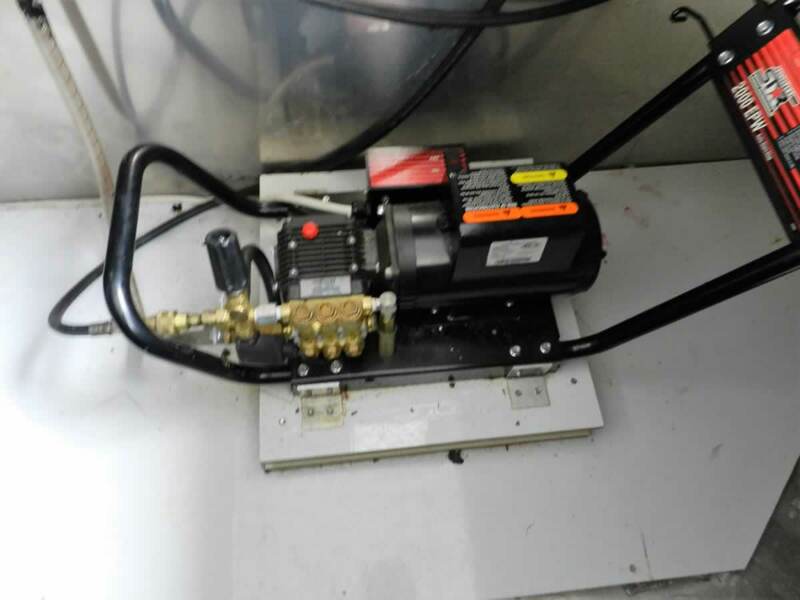 Engine compartment contains engine heater and auto oil change system. 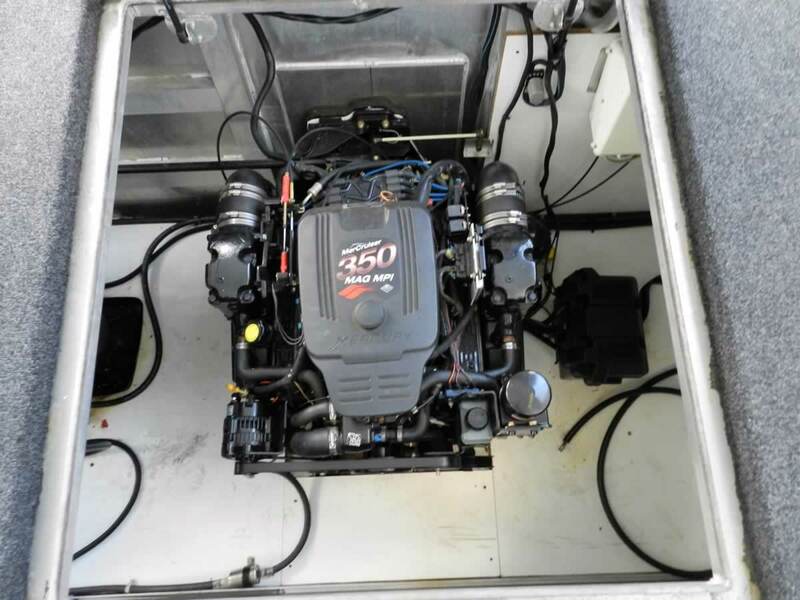 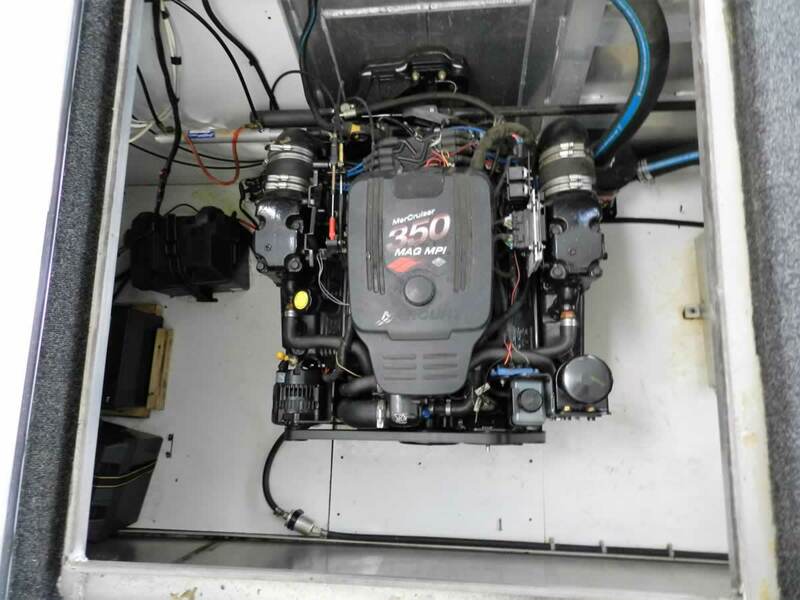 Twin 350’s provide plenty of power to cruise in style. 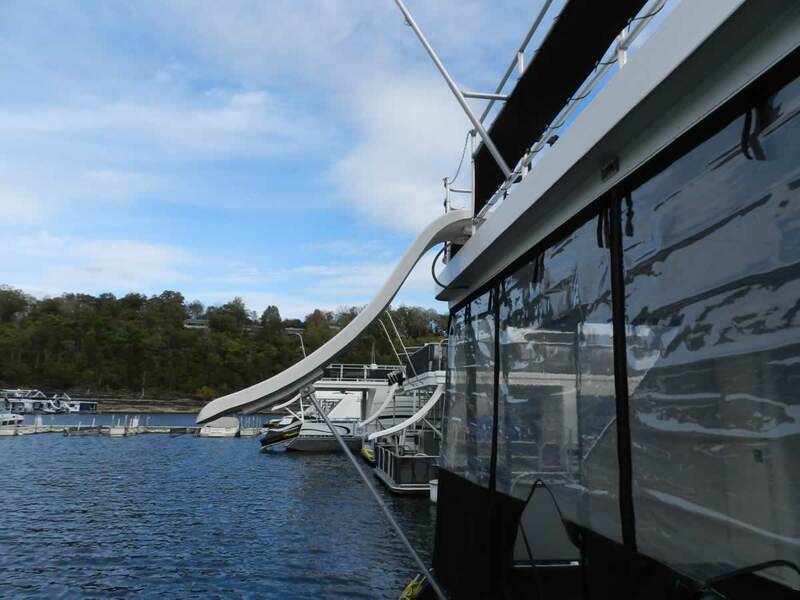 Angled aft deck has jet ski ramps and water slide. 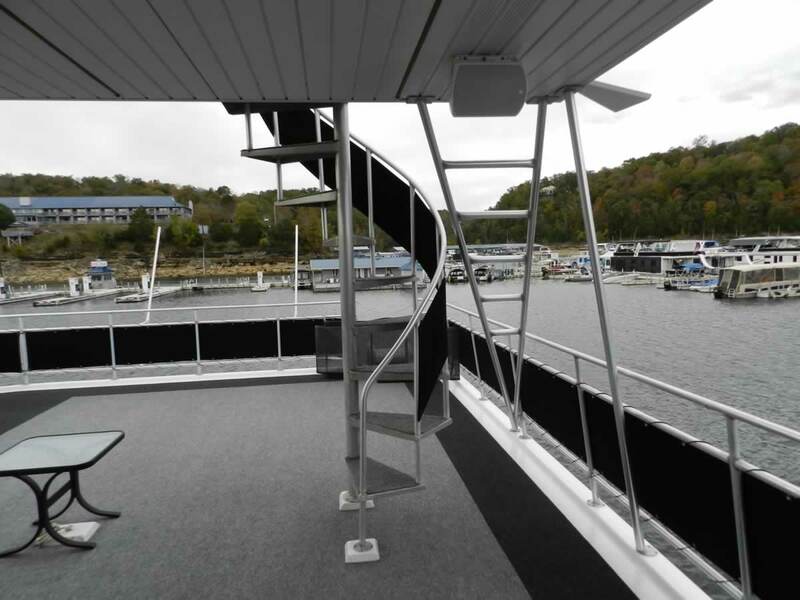 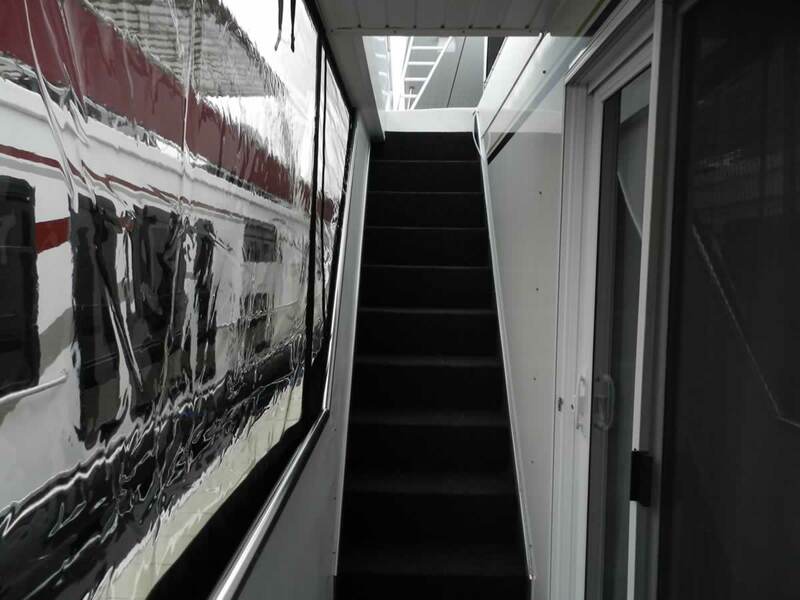 Extra bonus is PWC filling station and steps to top deck. 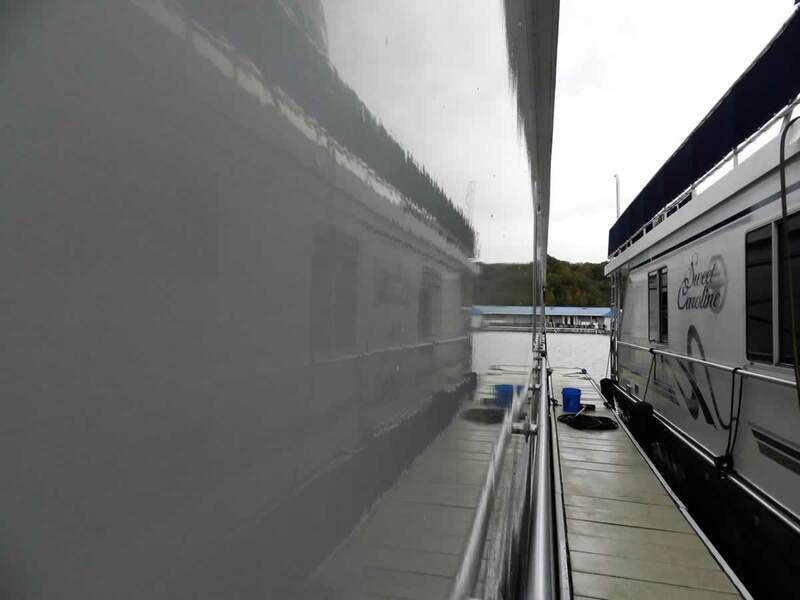 Head up top to truly appreciate the size of this boat. 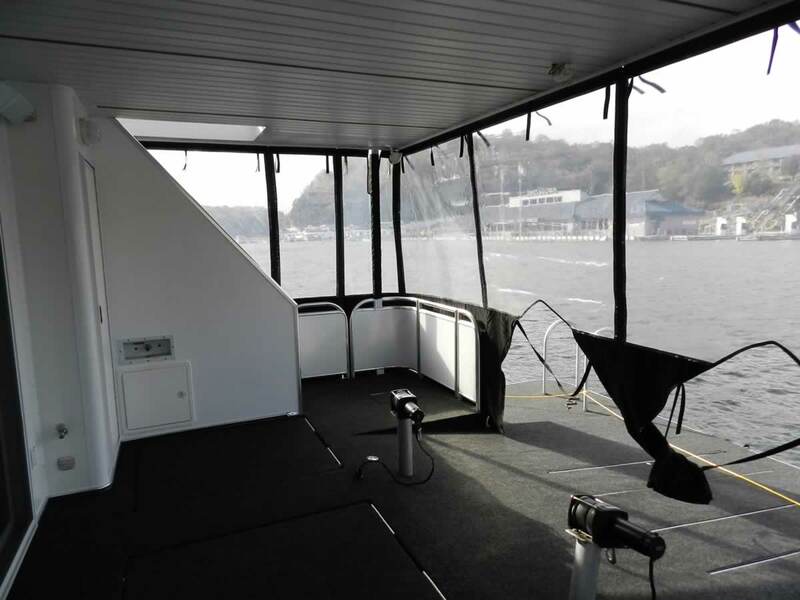 Plenty of room for all to enjoy the sun and view. 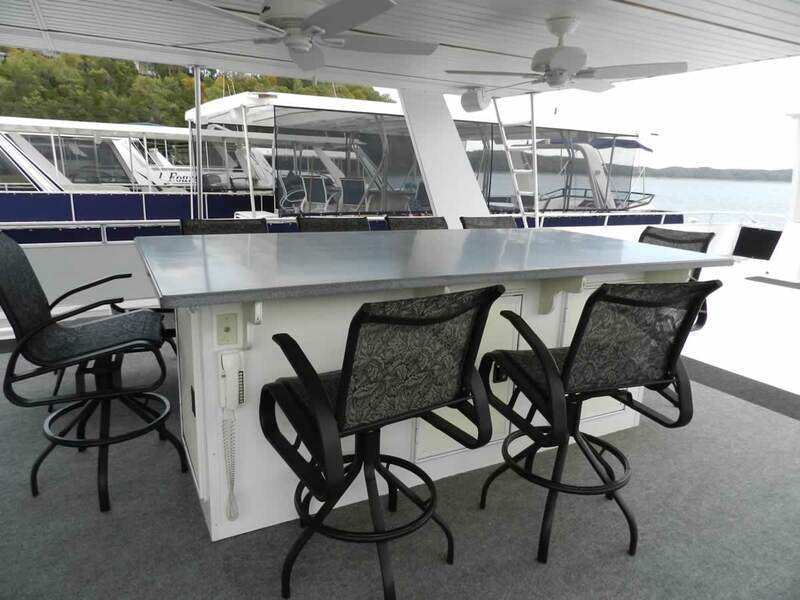 A large straight bar has seating for 9, plus a kidney shaped bar has seating for 4, plus another small bar with a sink. 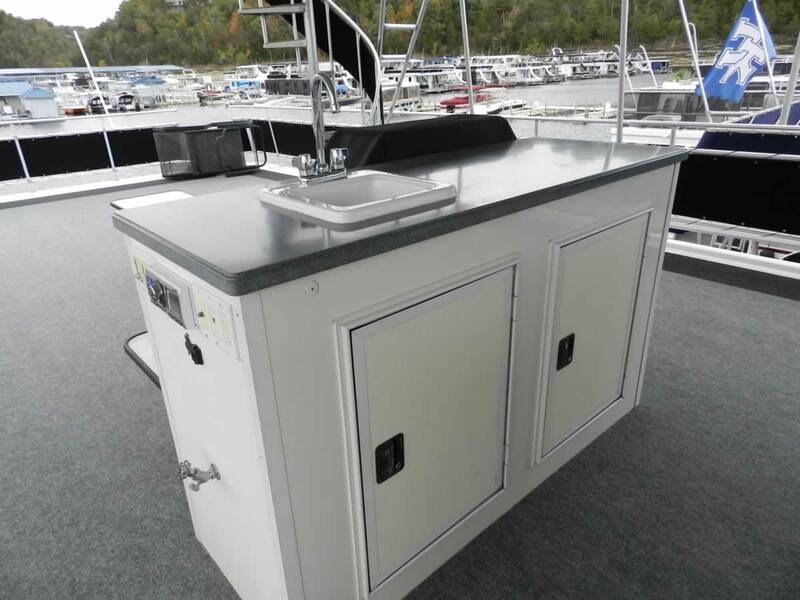 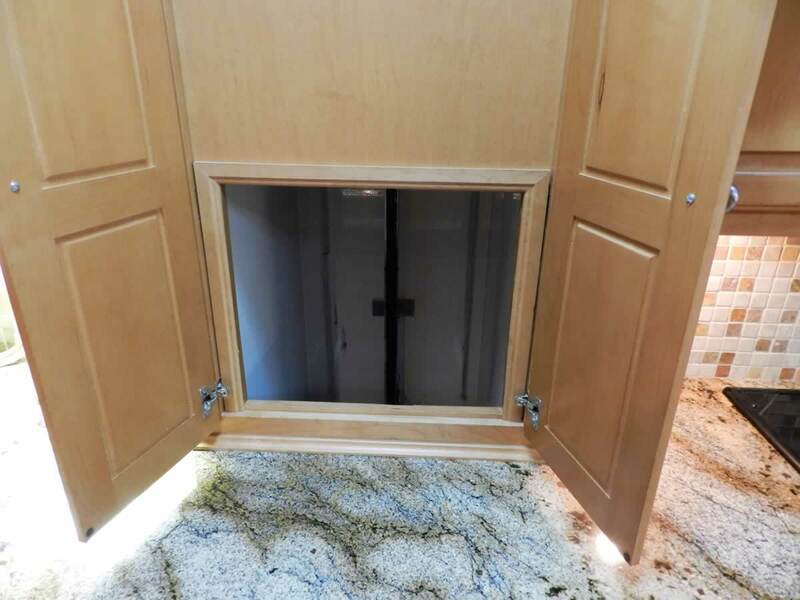 There is a free standing gas grill and a drop down TV in waterproof cabinet. 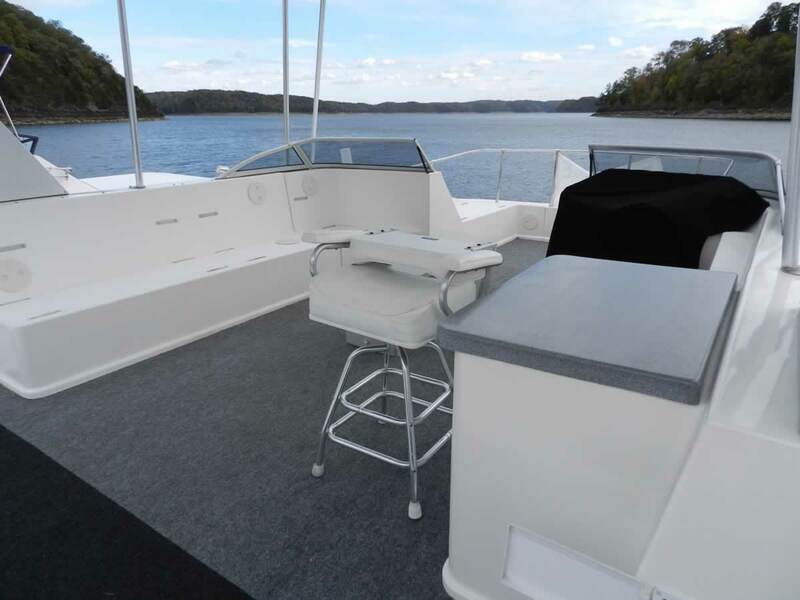 Sunlounger flybridge provides plenty of seats for passengers to keep the captain company. 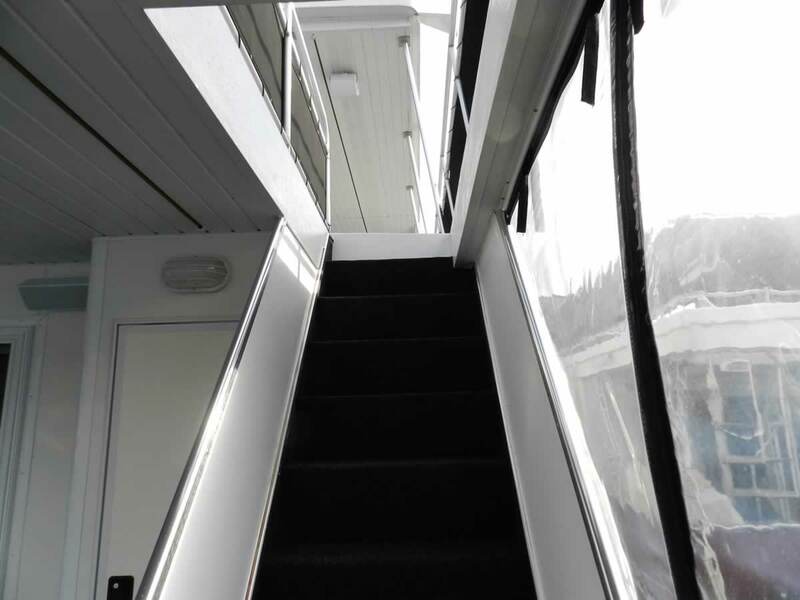 A spiral staircase leads to the third deck for even more space to enjoy the sun. 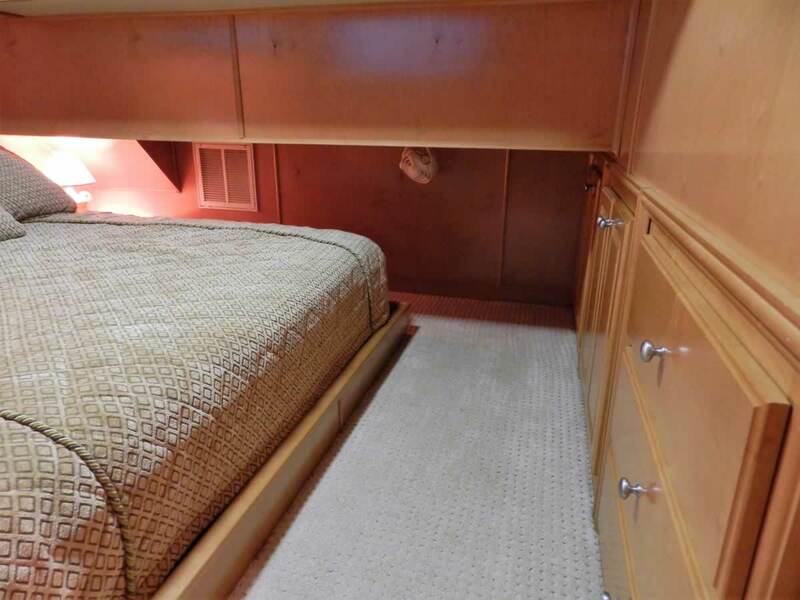 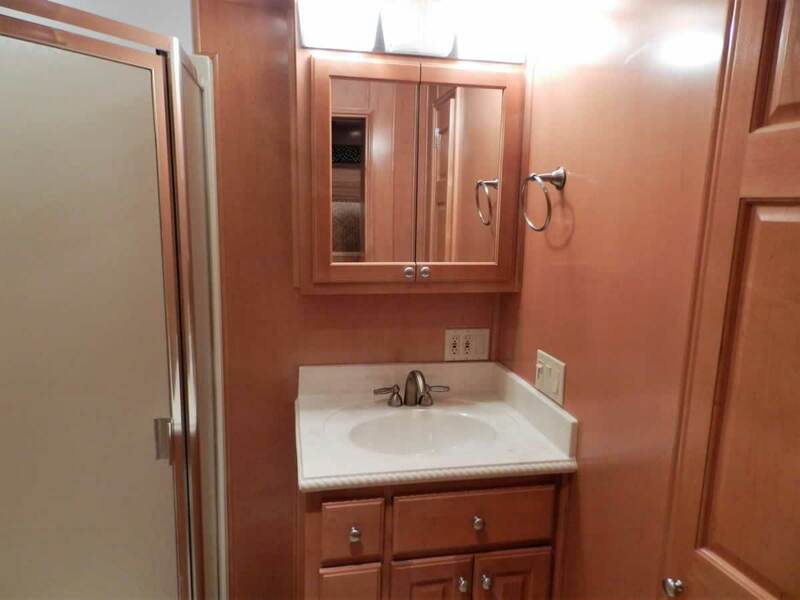 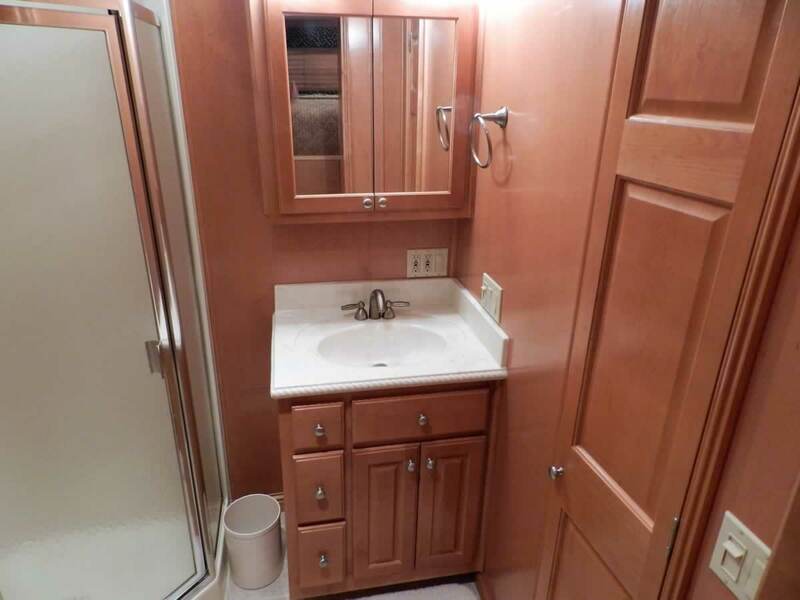 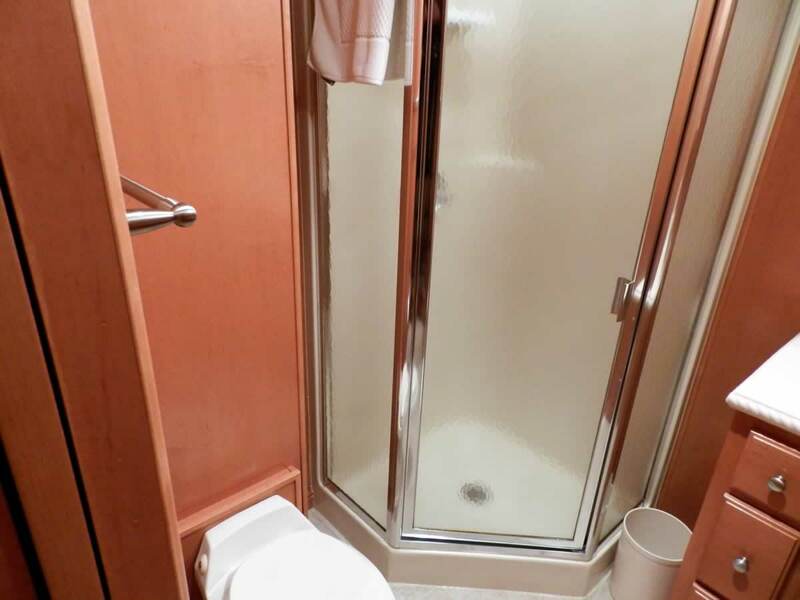 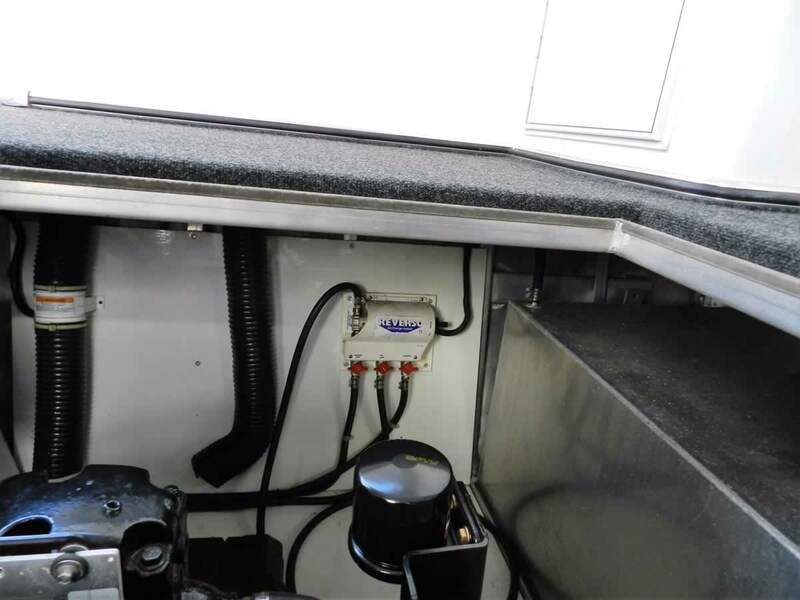 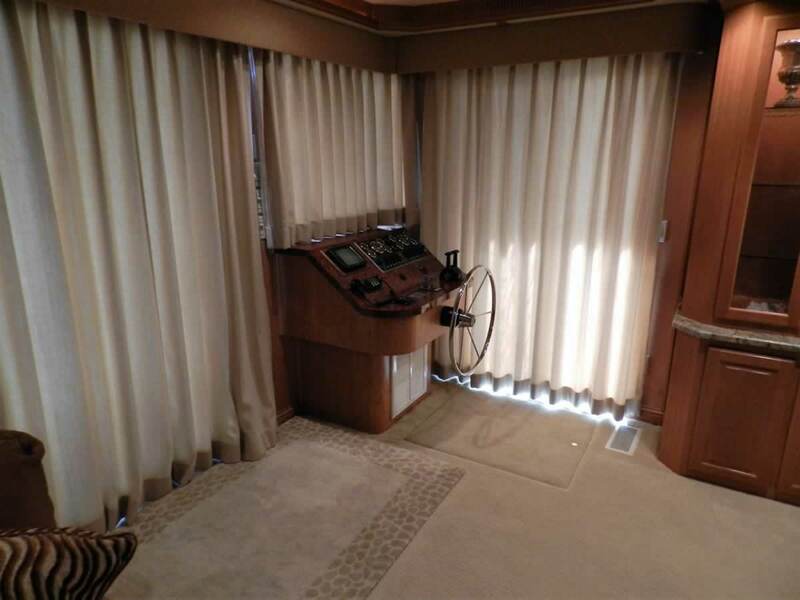 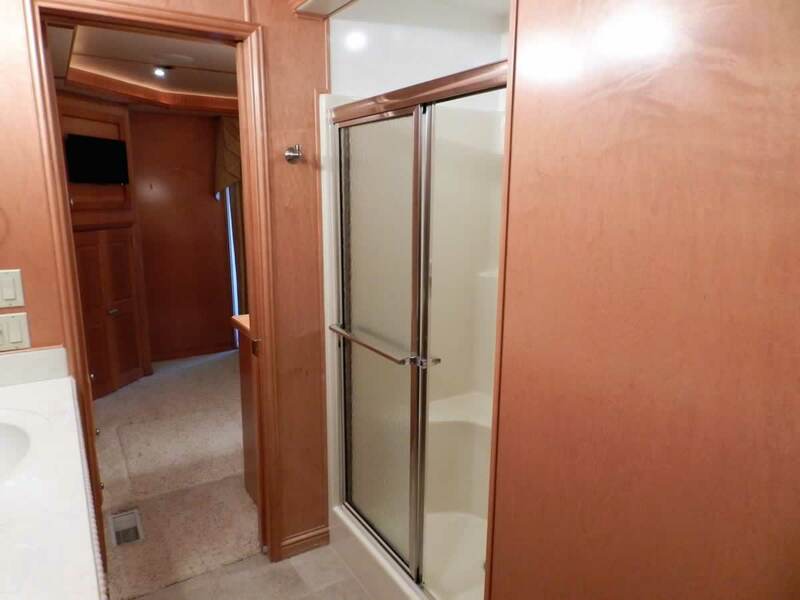 This boat has many extra amenities and tons of room, both inside and out. 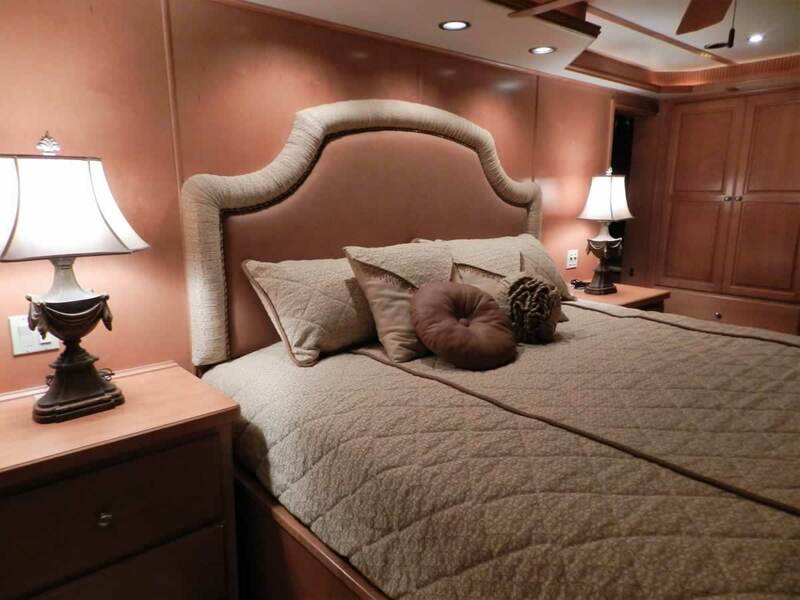 The Michelangelo is a true work of art. 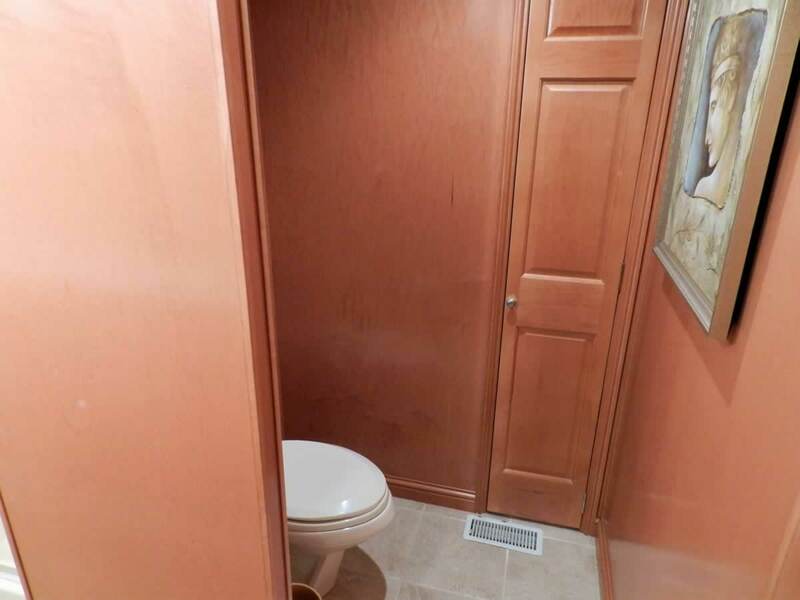 Call today to see it for yourself.